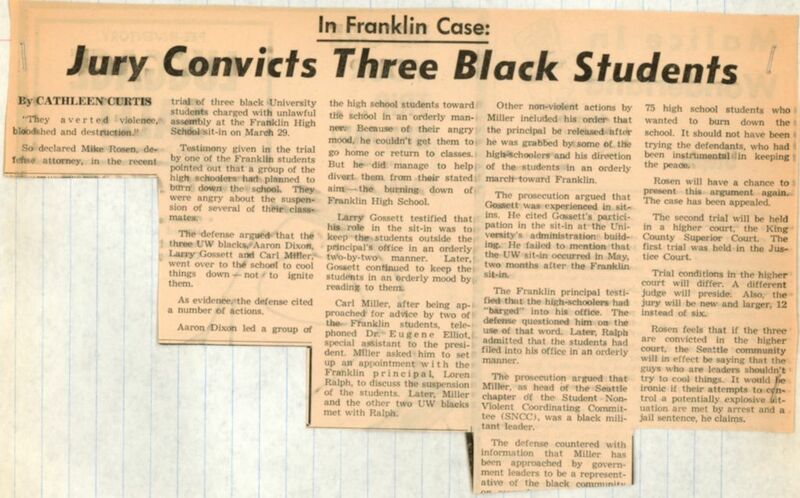 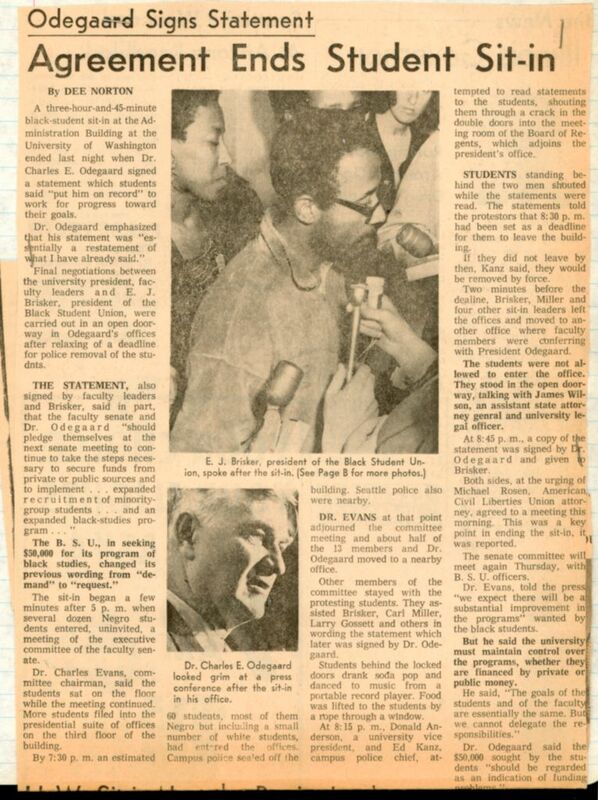 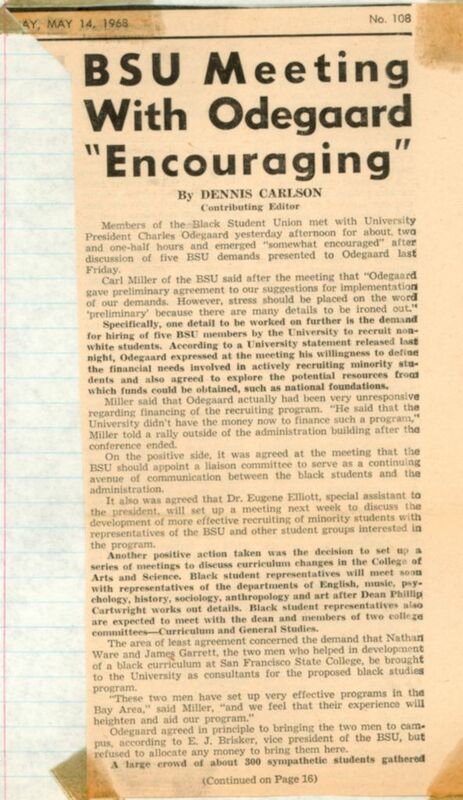 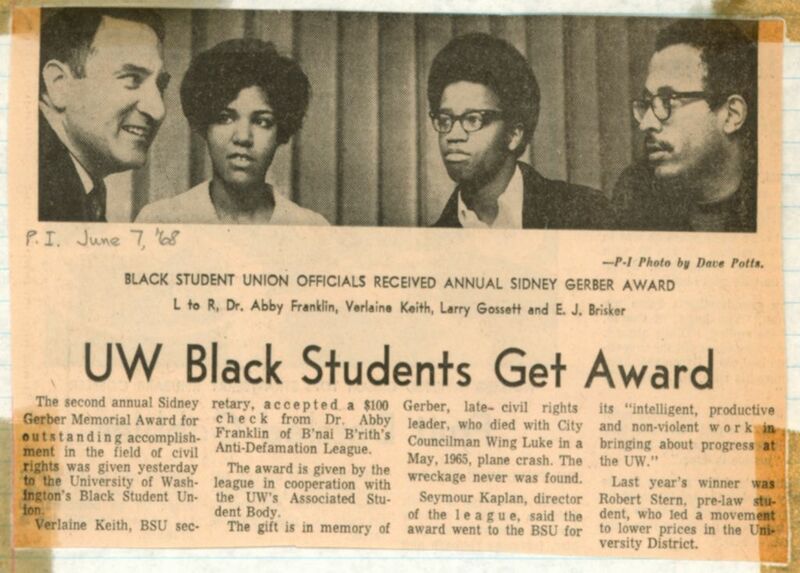 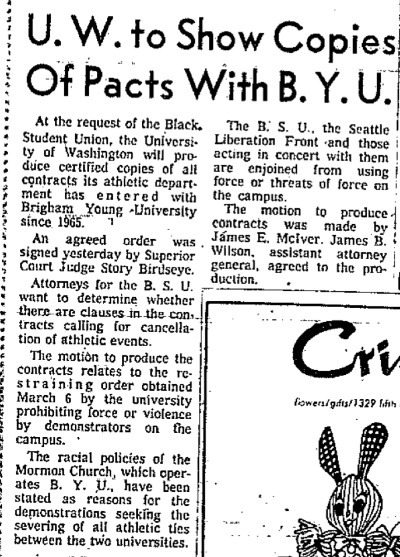 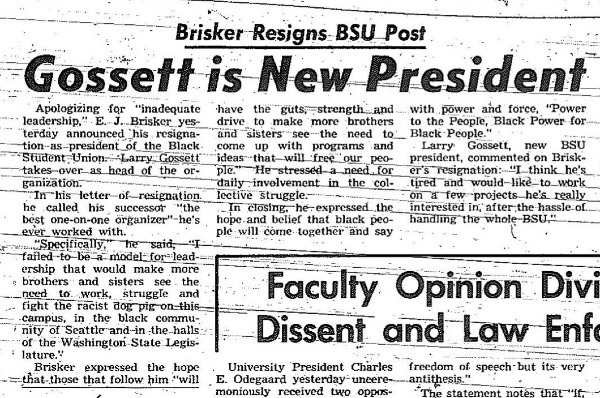 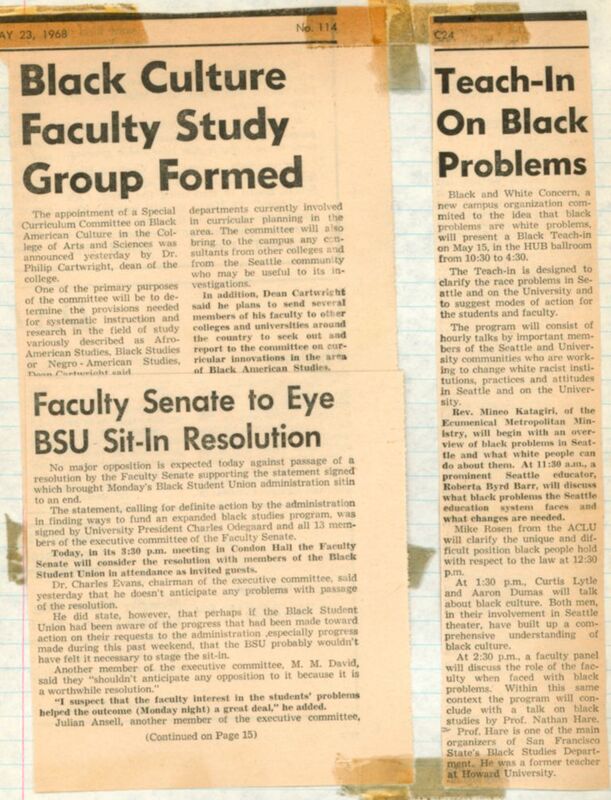 BSU activists made news as well as history. 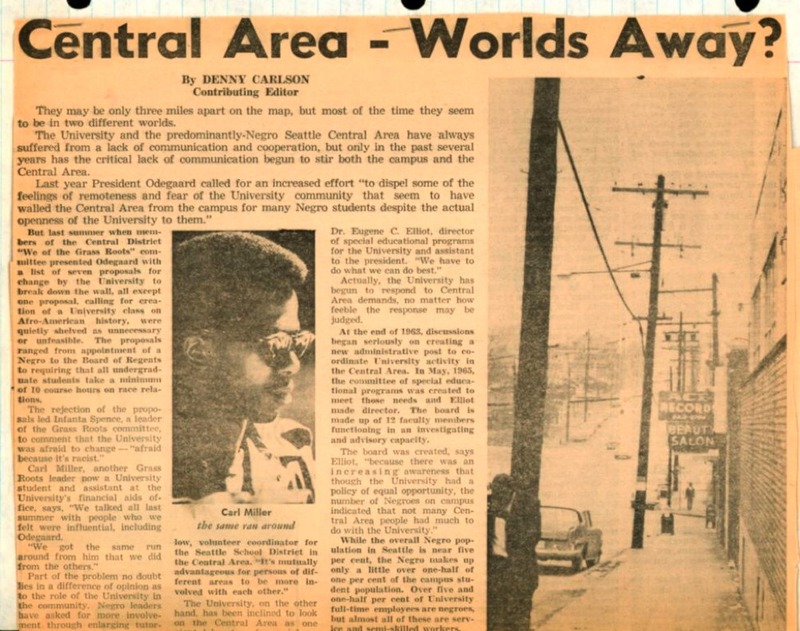 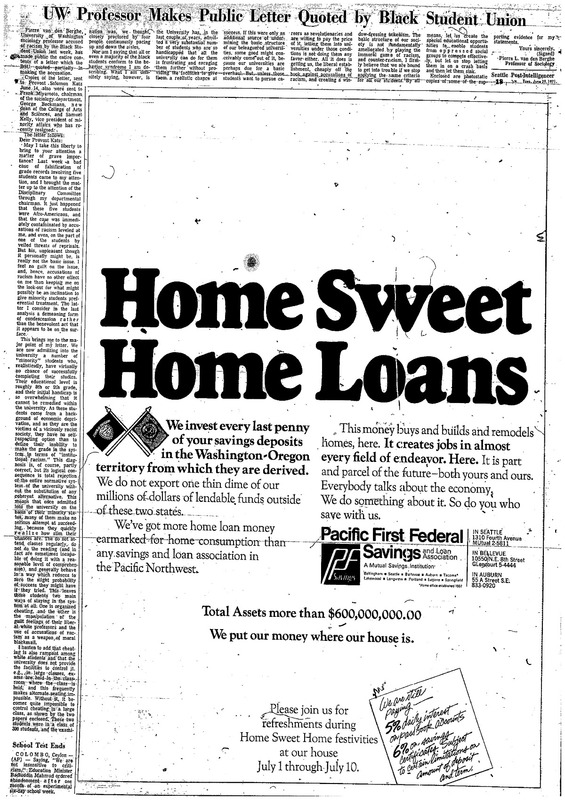 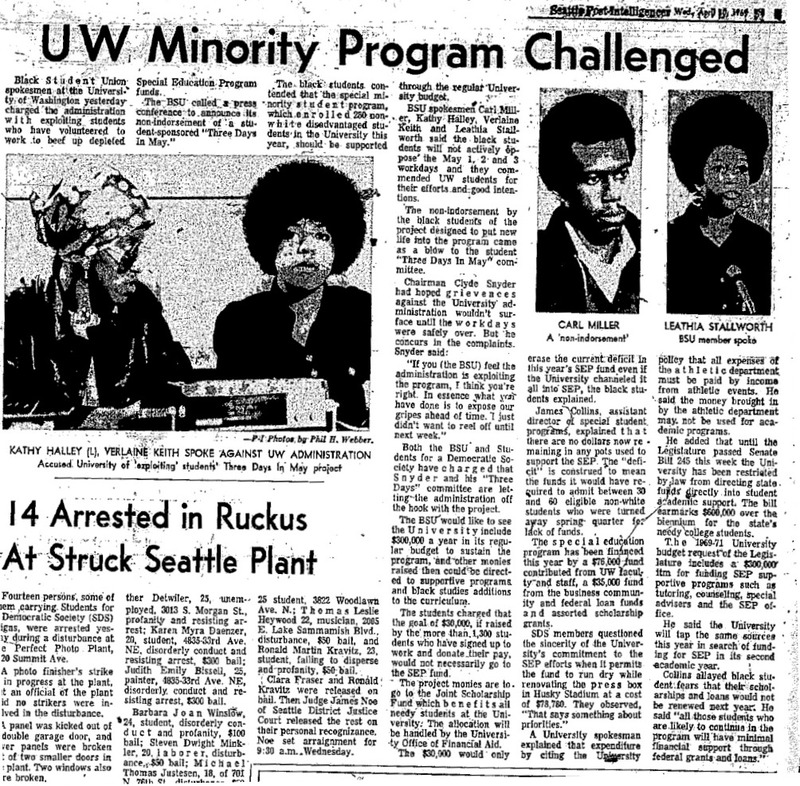 Here is a day-by-day digital archive of more than 200 articles published in the UW Daily,Seattle Times,Seattle Post-Intelligencer, Afro-American Journal, and Seattle Medium between 1967 and 1973, with some additional articles from the 1980s and 1990s. 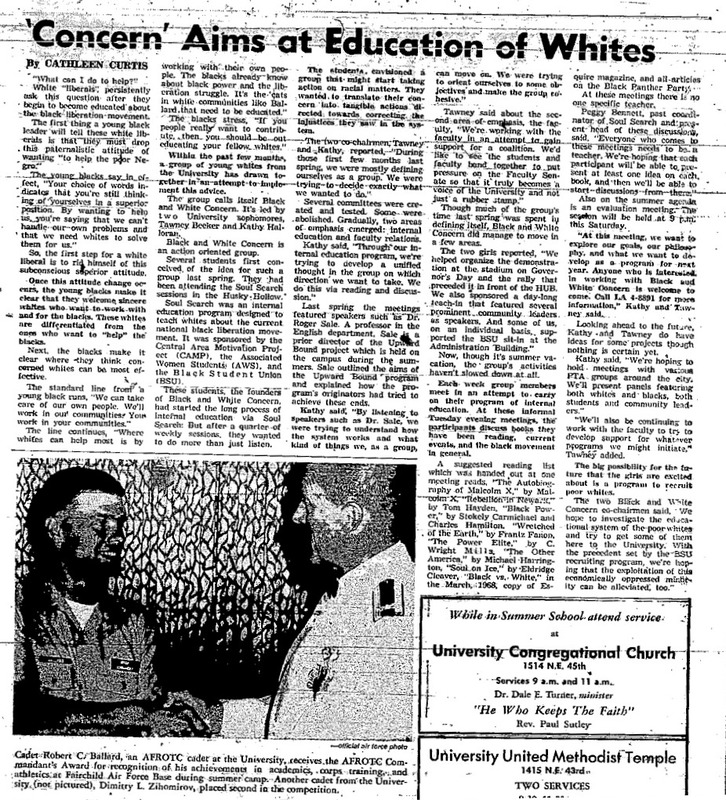 Click the titles to read the articles. 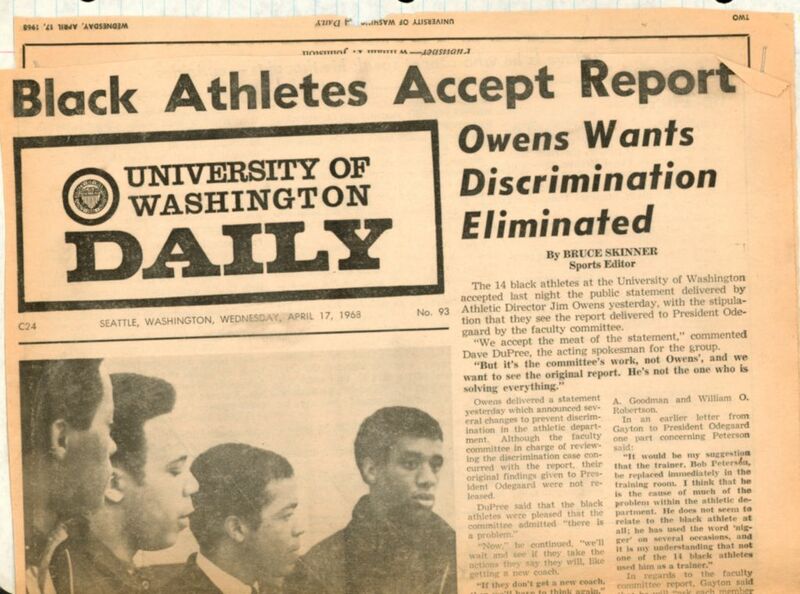 Marc Robinson, Tikia Gilbert, and Edgar Flores digitized most of these articles. 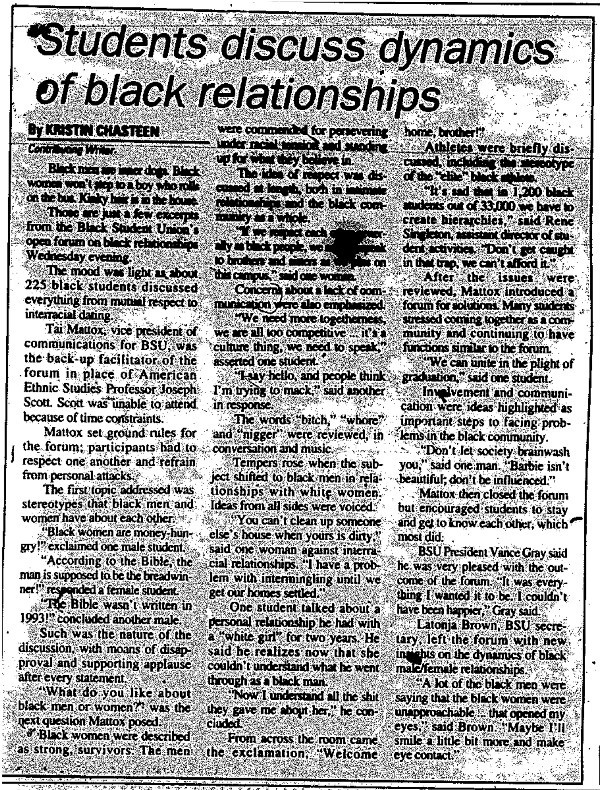 Others are from the Larry Gossett collection. 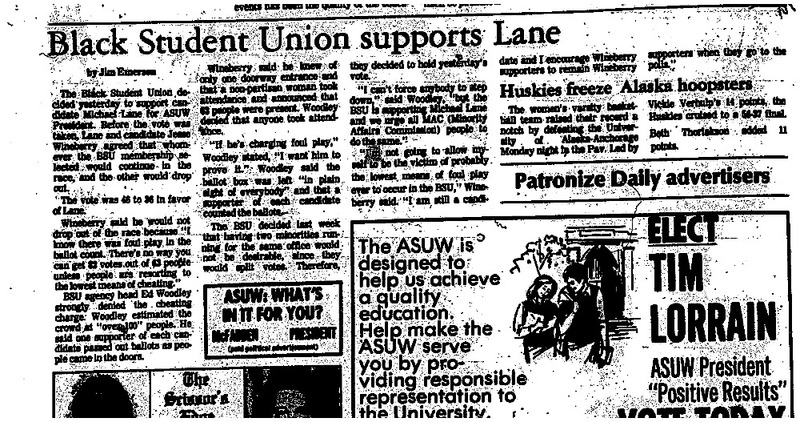 16-Feb-68 UW Daily The voice of the U.W. 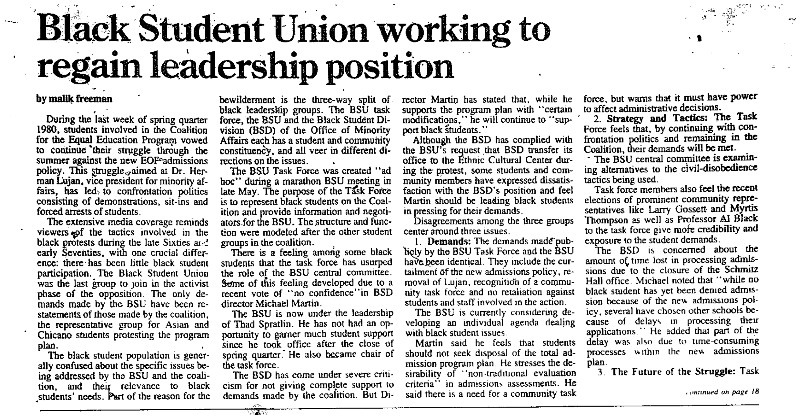 BSU: the word is now! 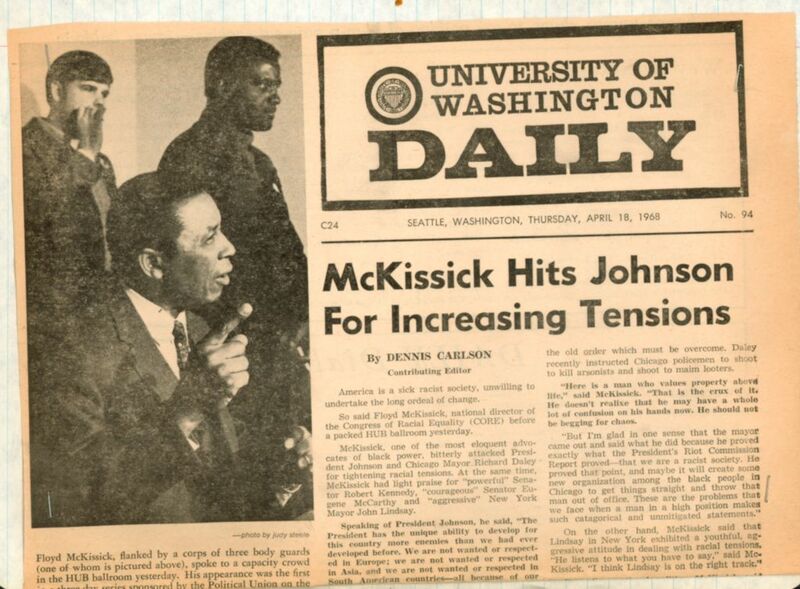 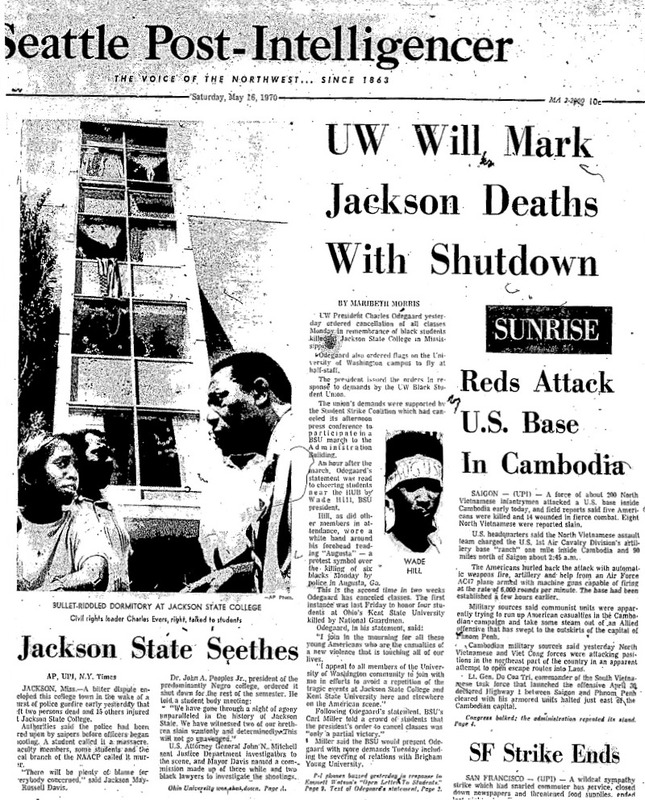 18-Apr-68 UW Daily McKissick Hits Johnson for Increasing Tensions, cont. 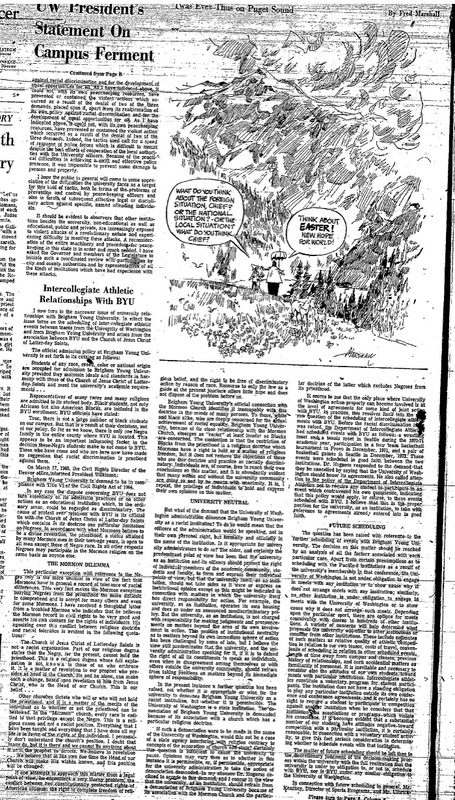 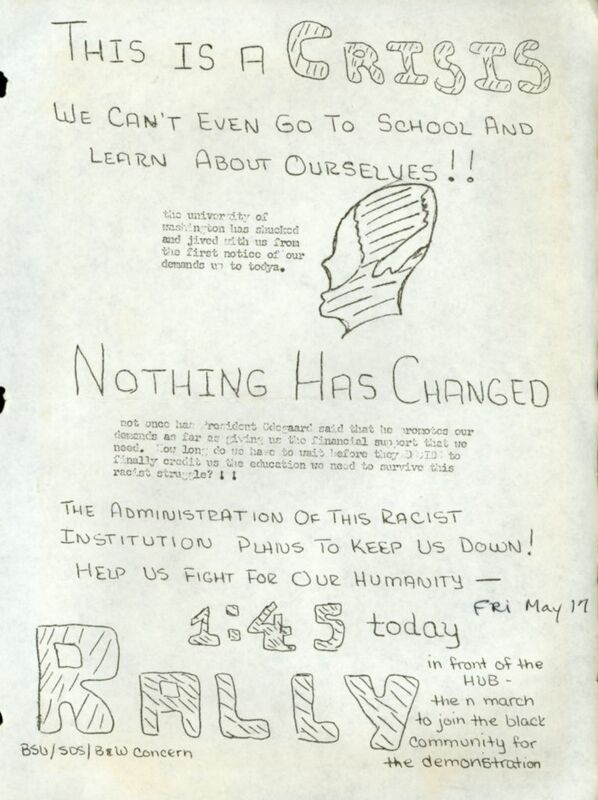 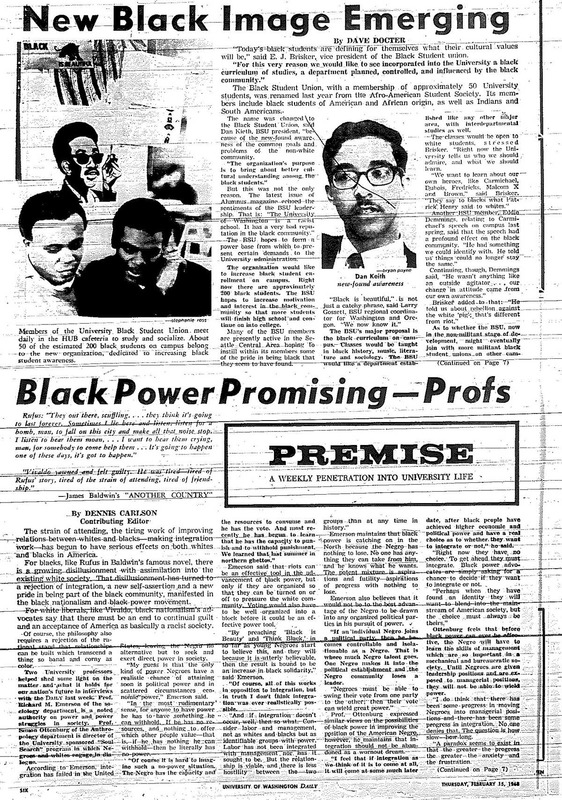 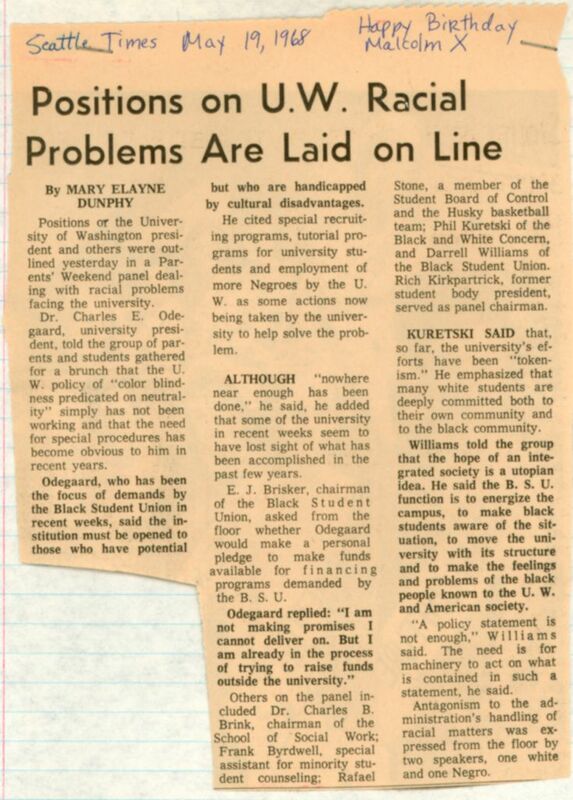 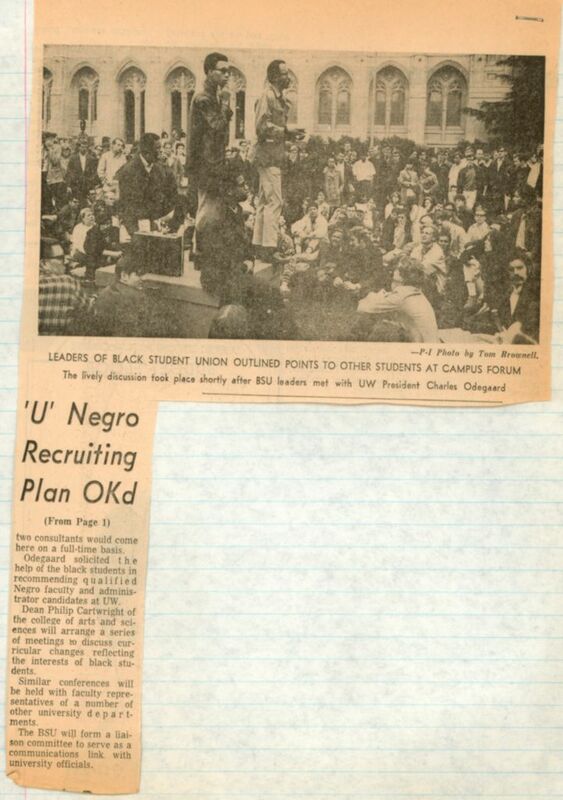 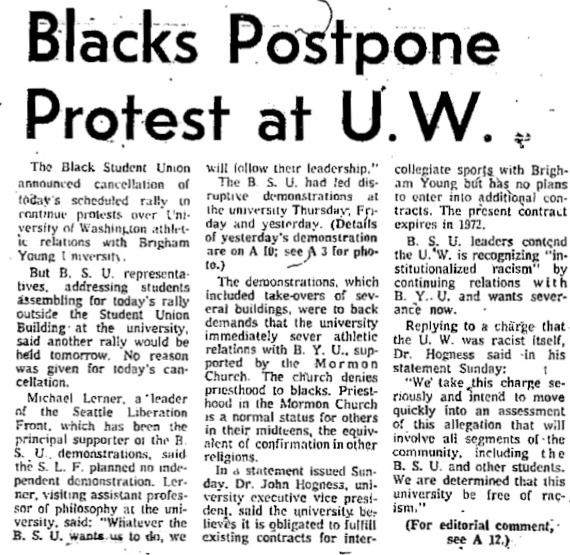 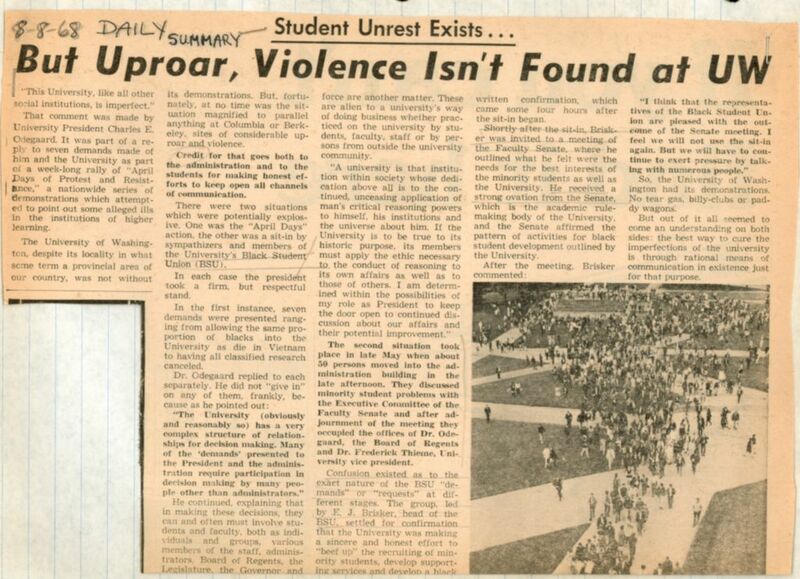 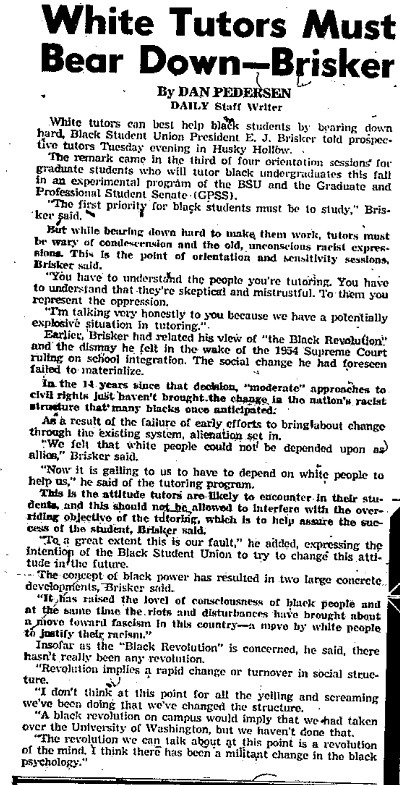 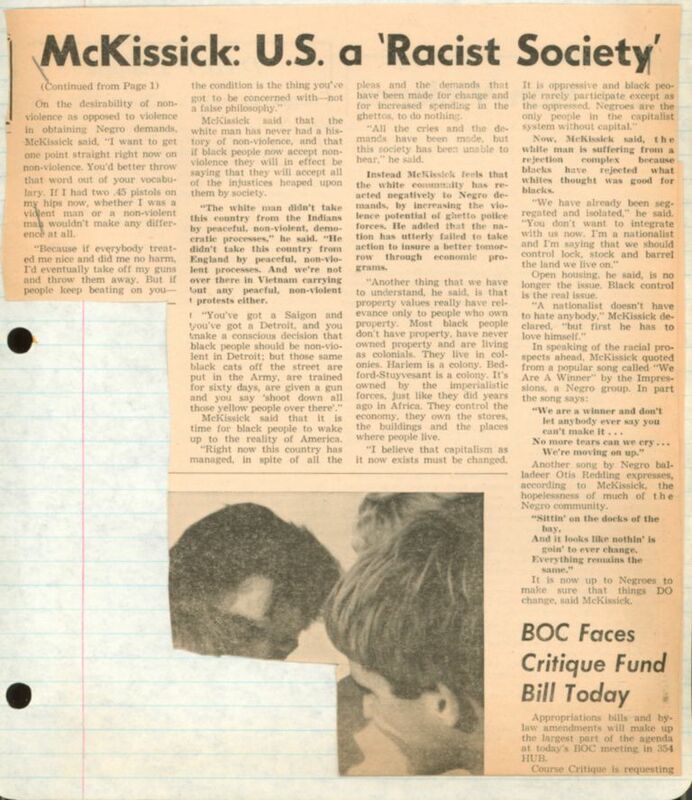 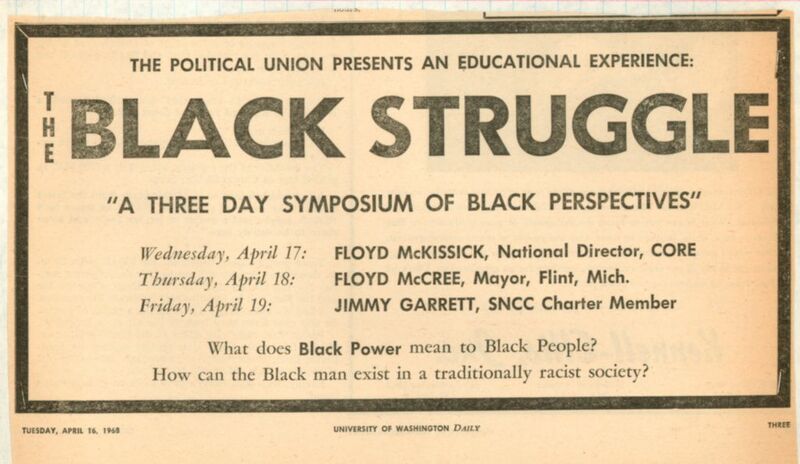 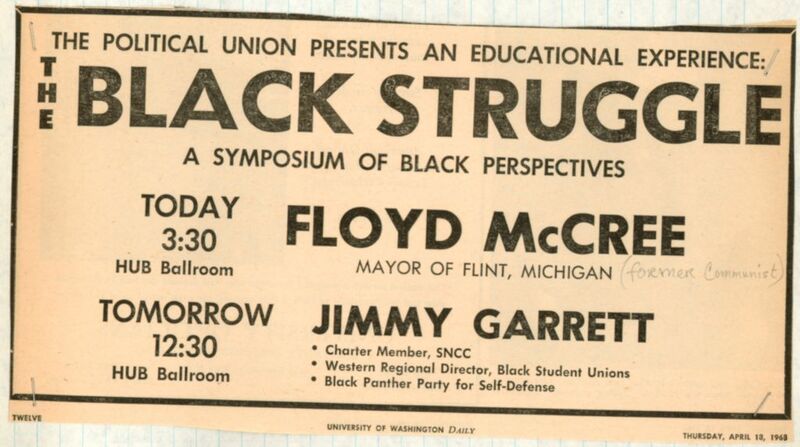 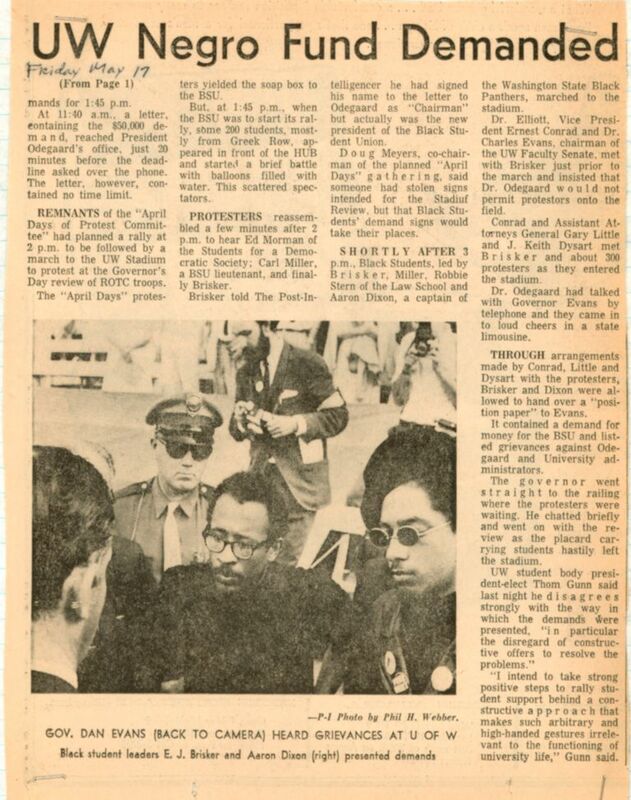 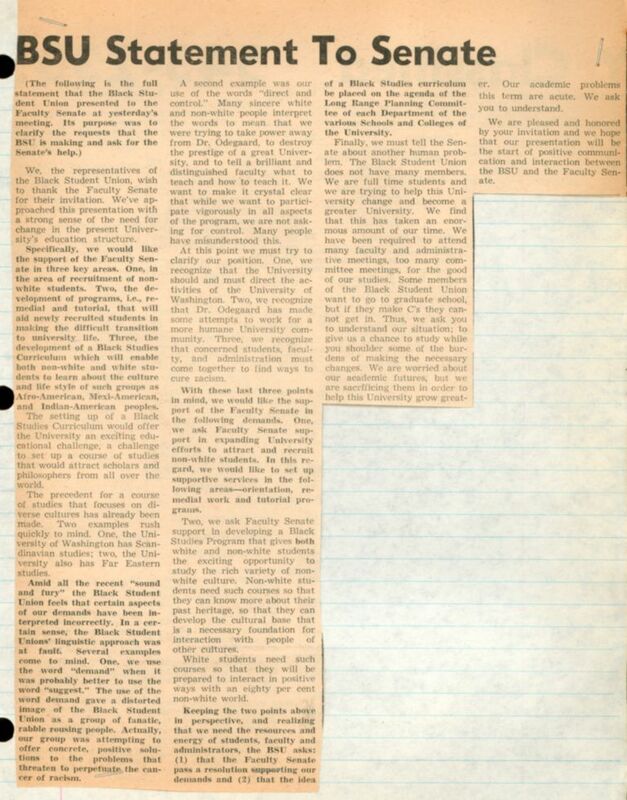 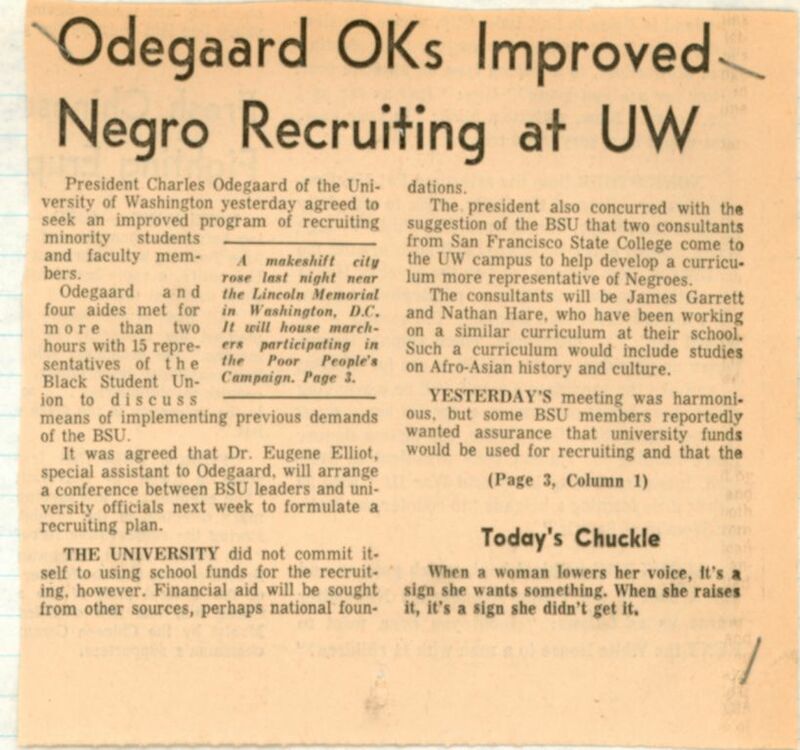 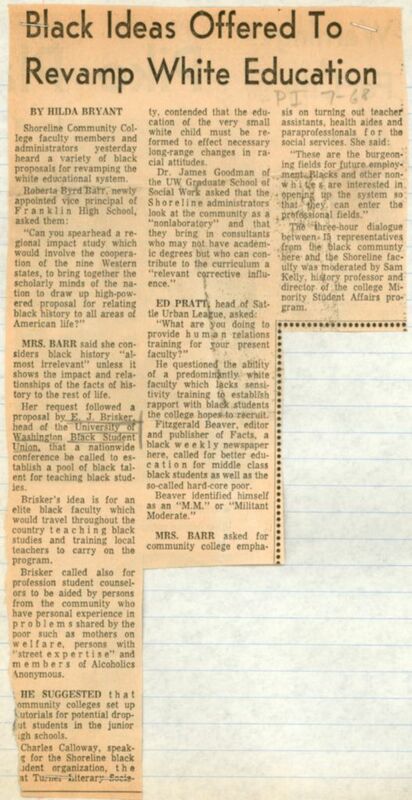 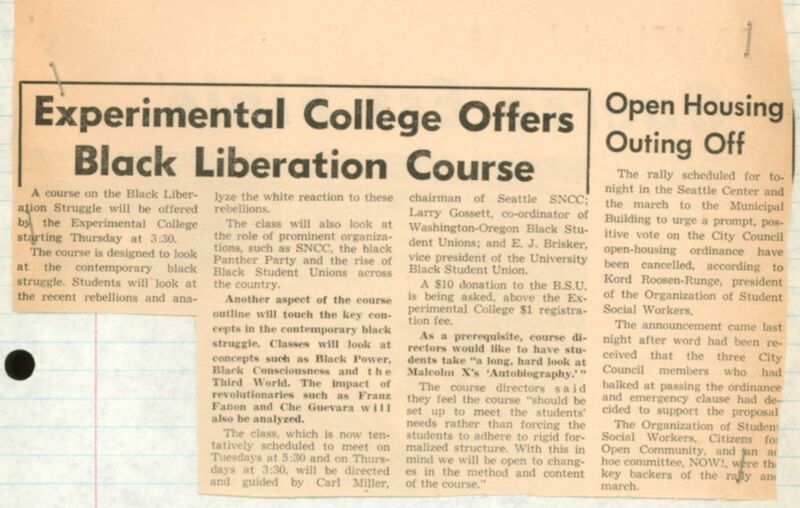 UW Daily Floyd McKissick on Campus: "Non-Violent Until Pushed"
14-May-68 UW Daily BSU meeting with Odegaard "encouraging"
17-May-68 leaflet "This is a CRISIS"
17-May-68 leaflet "Black People Are Threatened"
8-Aug-68 UW Daily Several groups assist in education for minorities, cont. 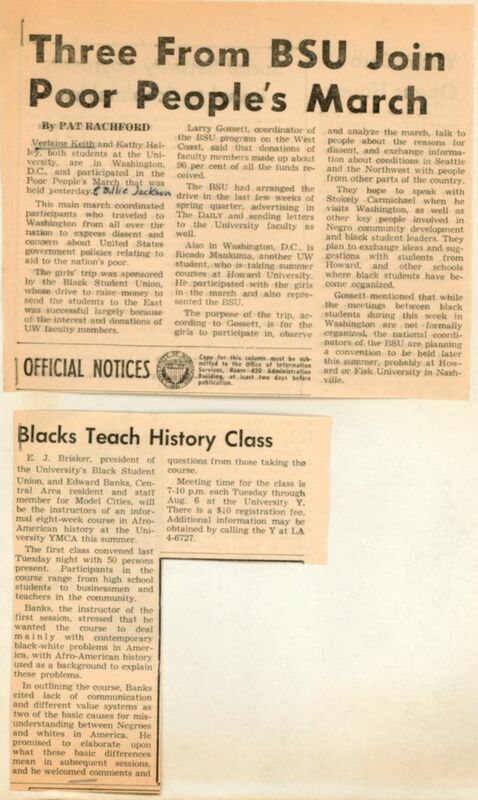 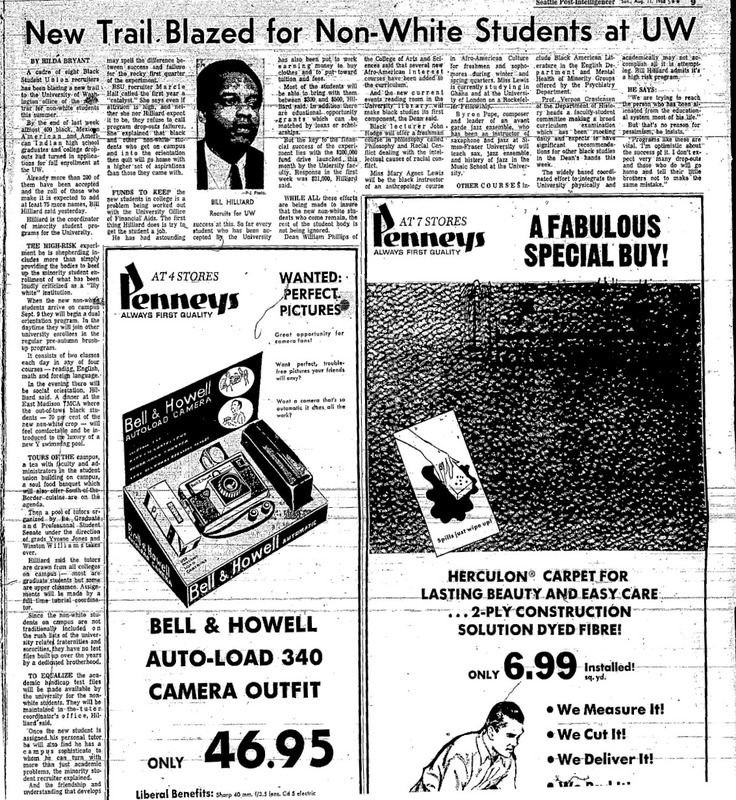 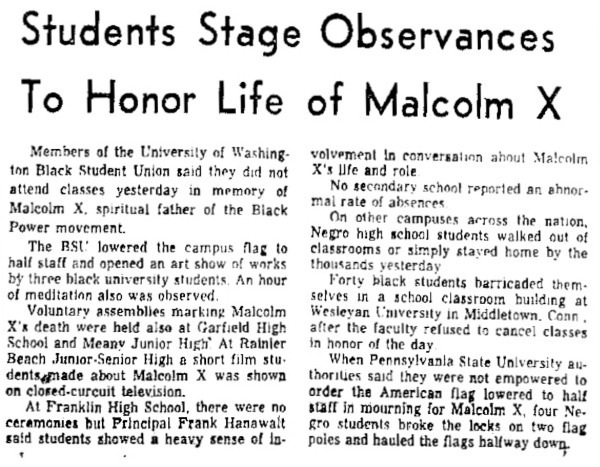 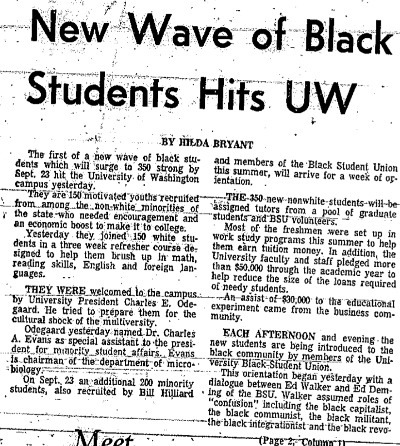 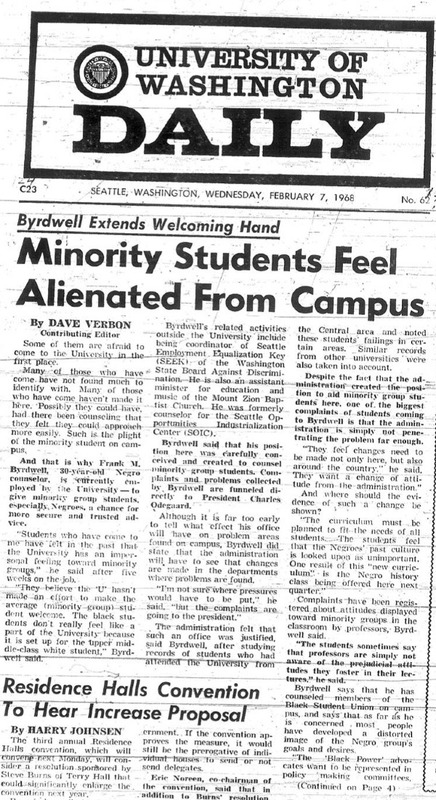 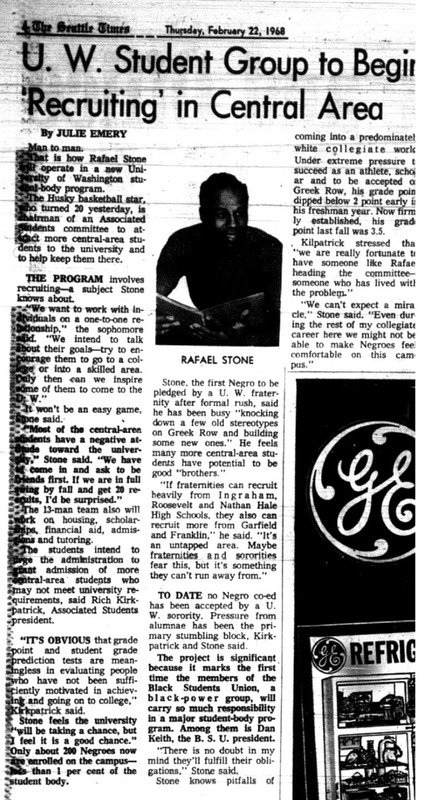 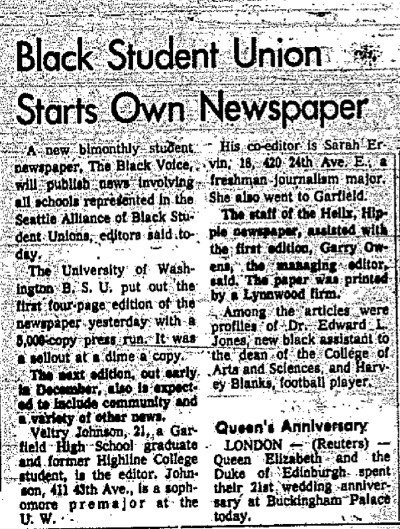 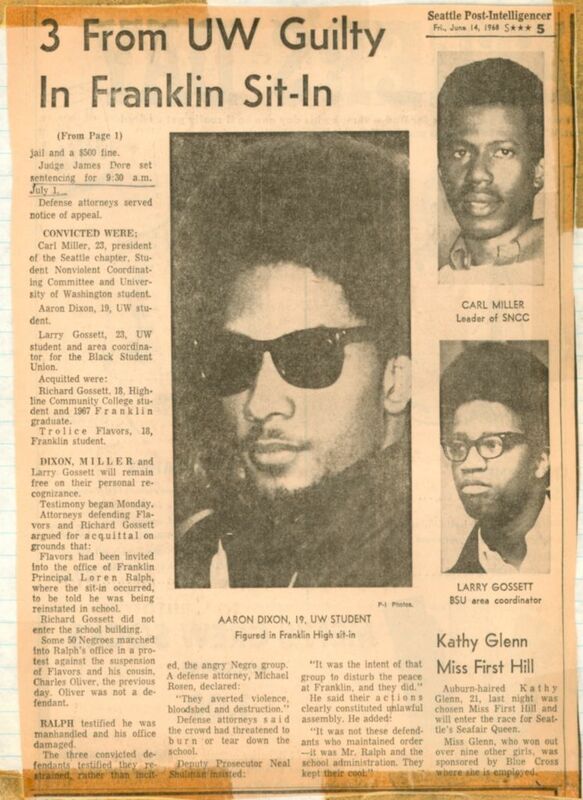 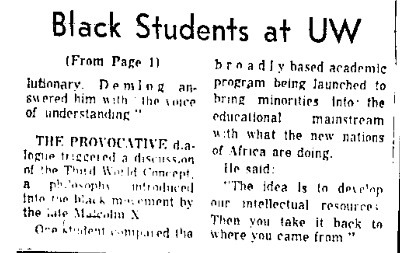 10-Sep-68 Seattle PI New Wave of black students hits UW, cont. 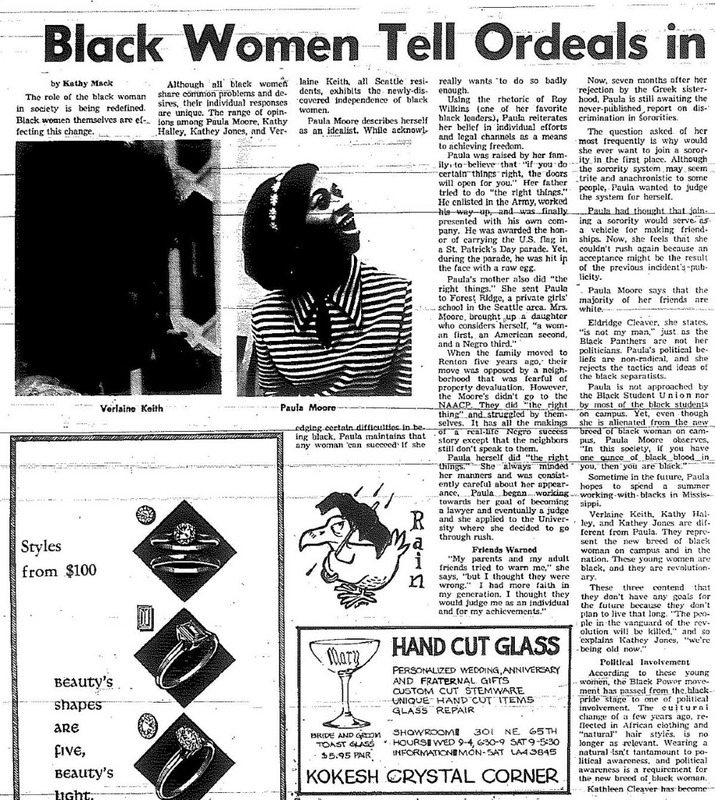 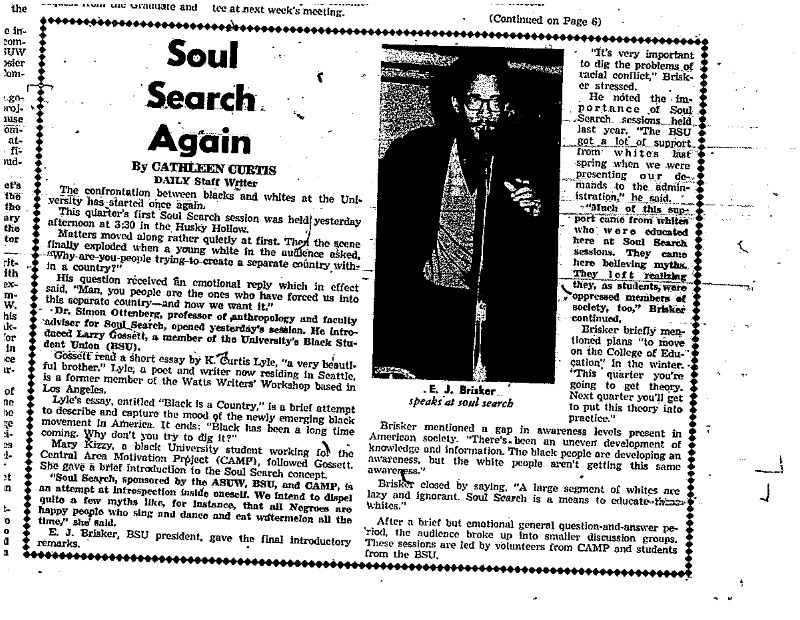 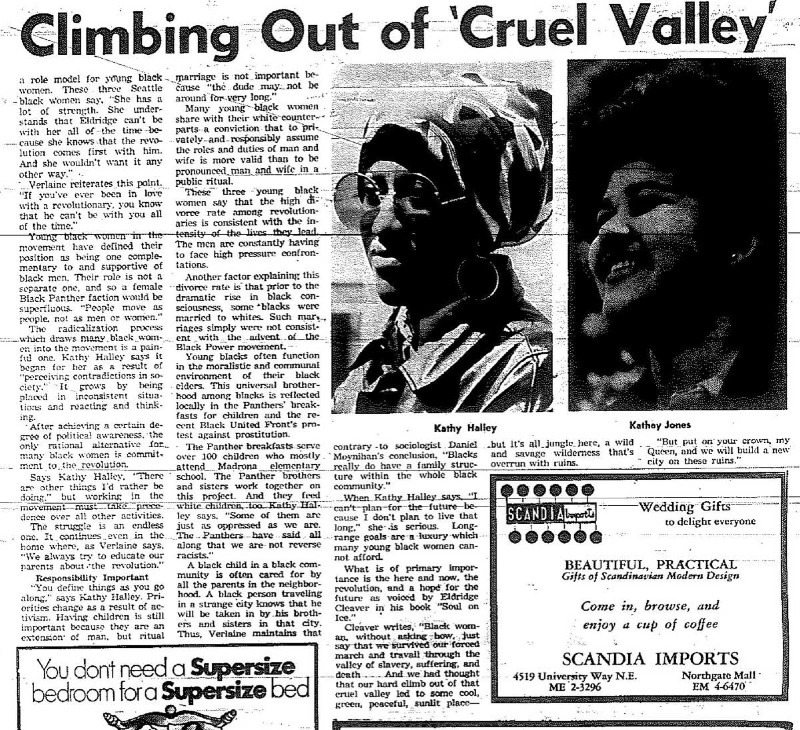 22-Apr-69 UW Daily Black women tell ordeals in climbing out of "cruel valley"
22-Apr-69 UW Daily Black Women tell ordeals in climbing out of "cruel valley," cont. 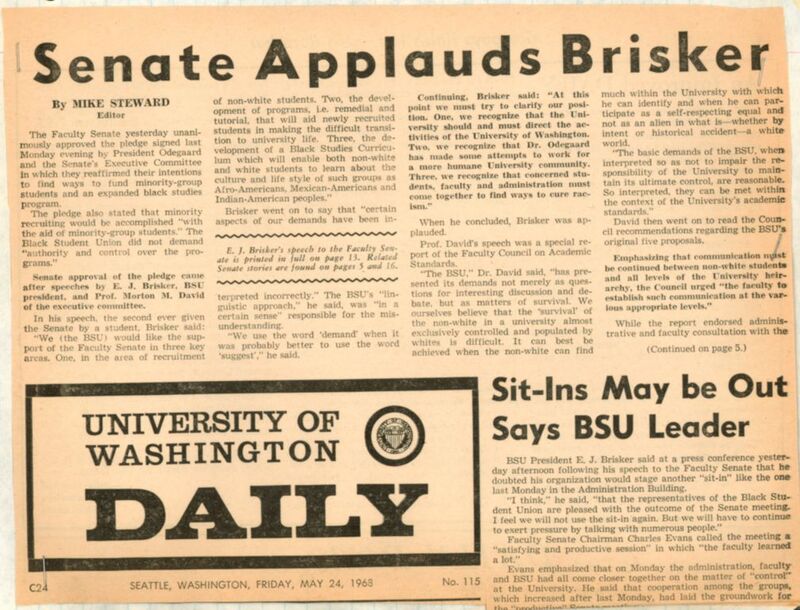 16-May-69 Seattle Times B.S.U. 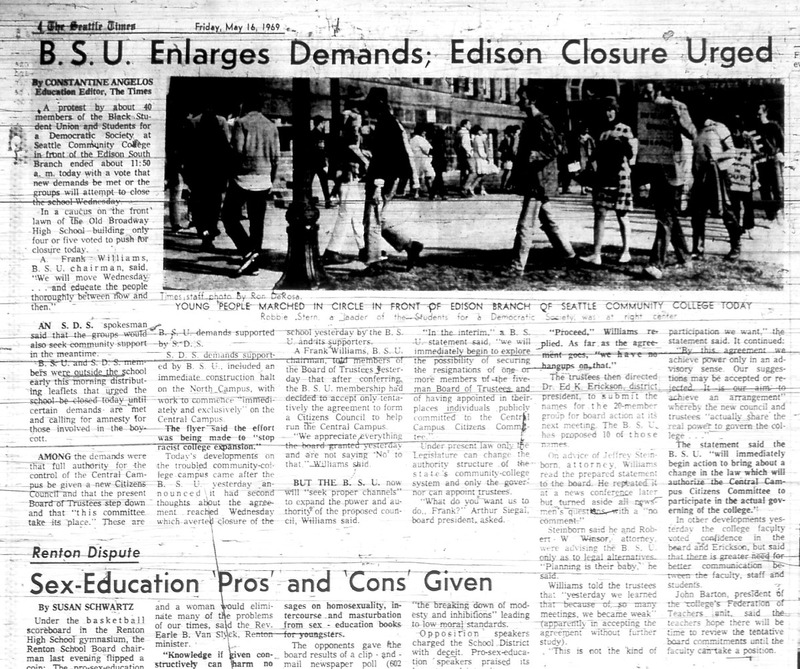 enlarges demand; Edison closure urged: Seattle Community College OK's south campus tract. 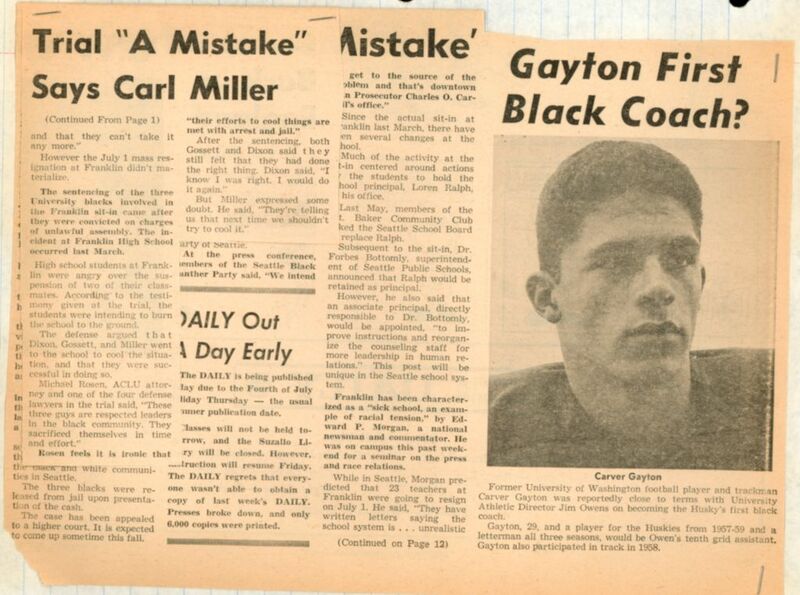 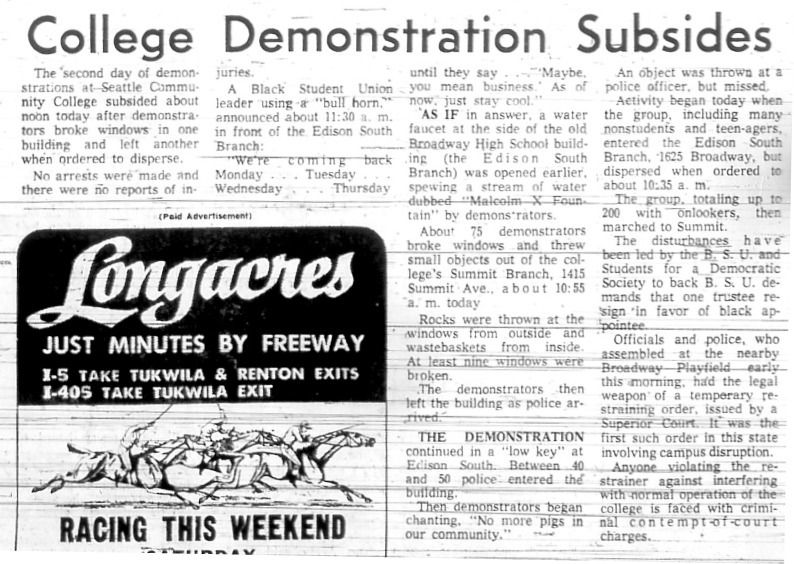 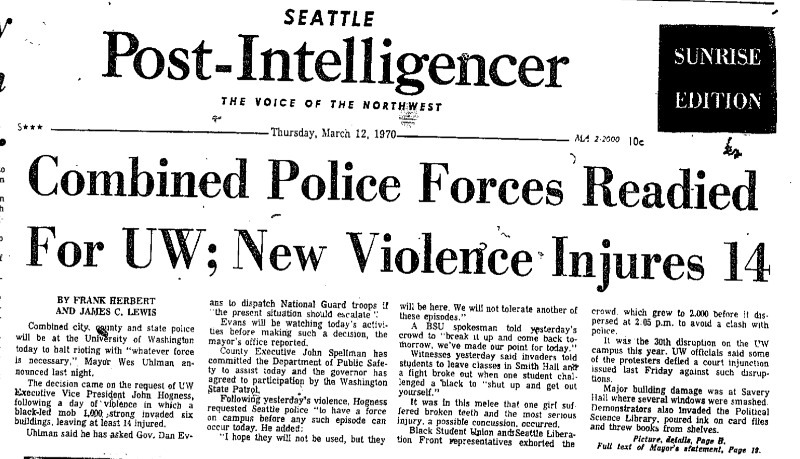 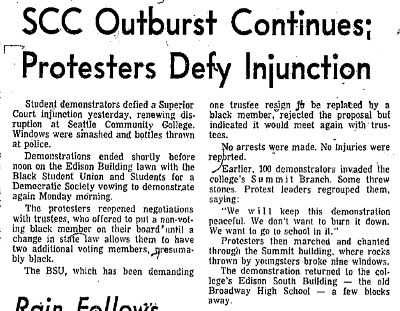 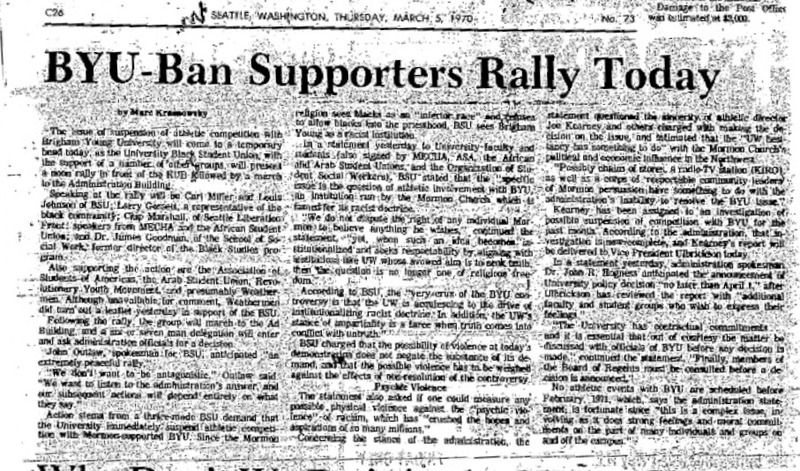 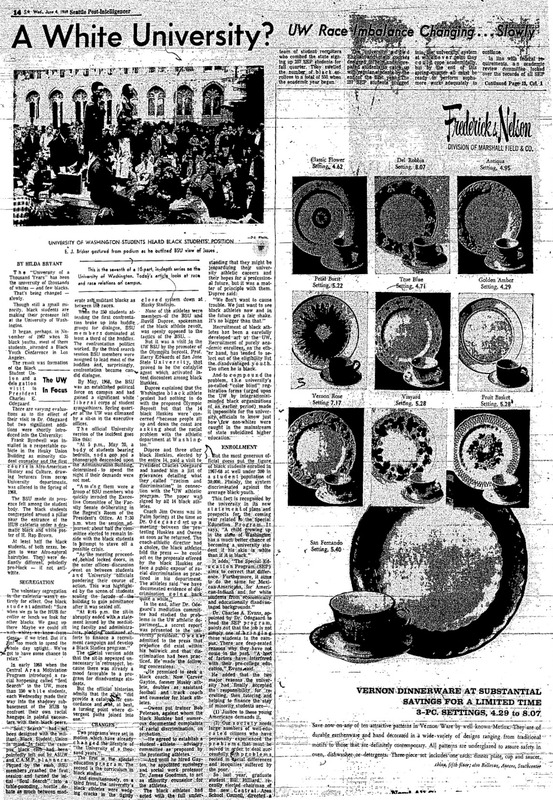 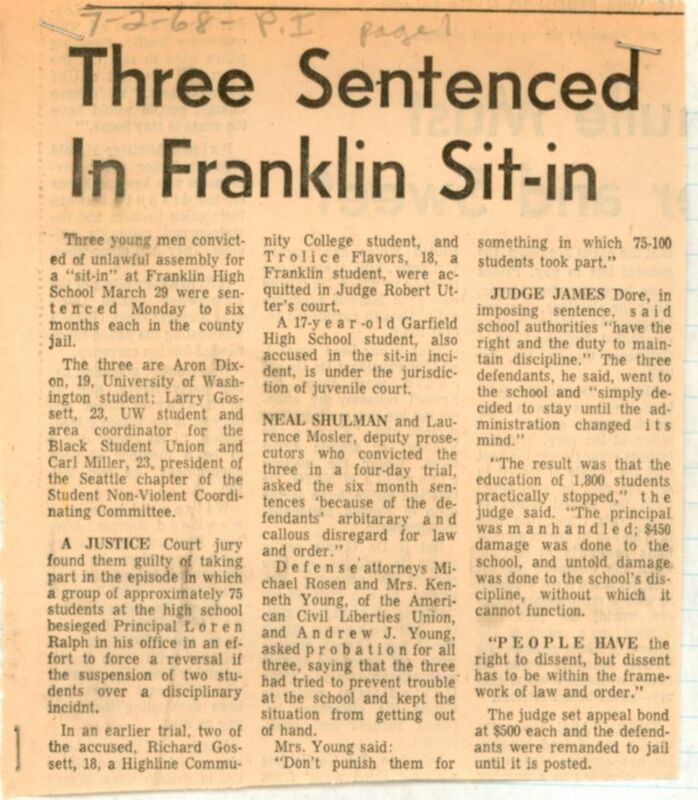 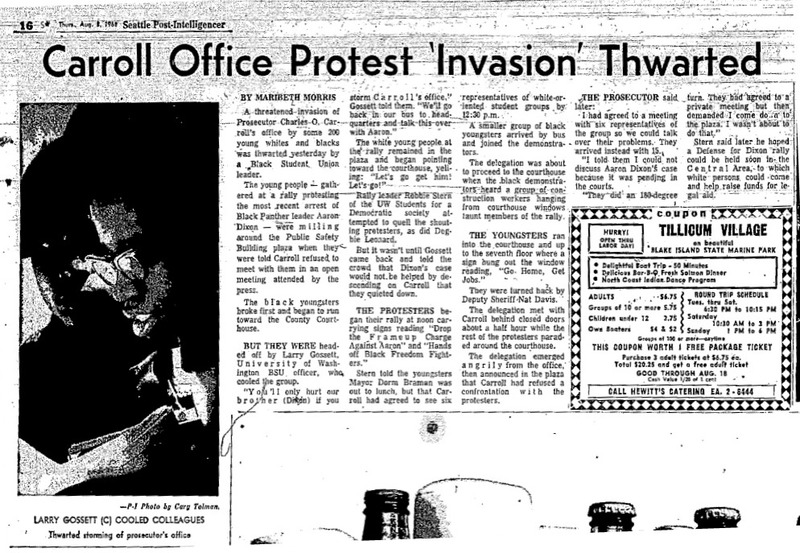 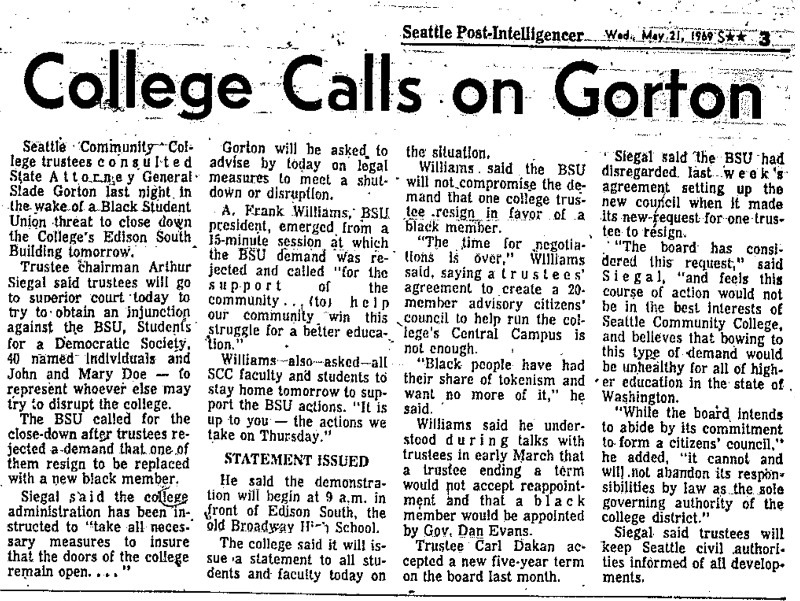 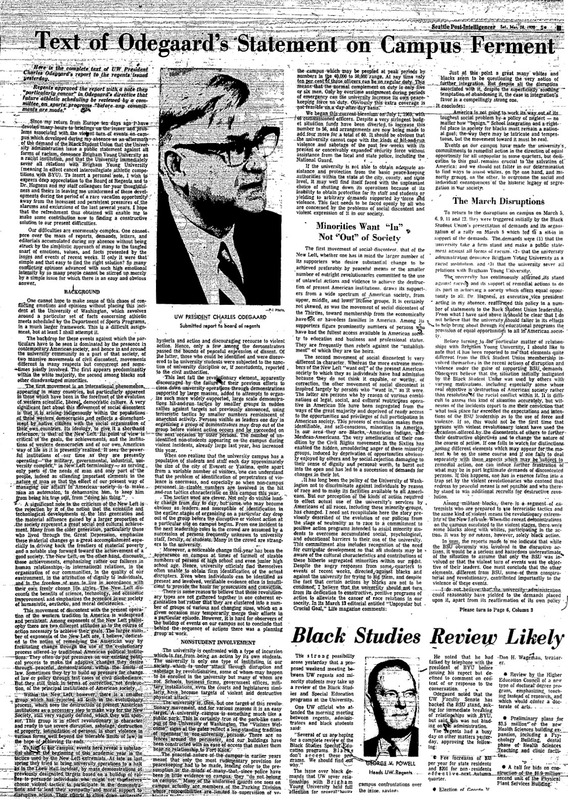 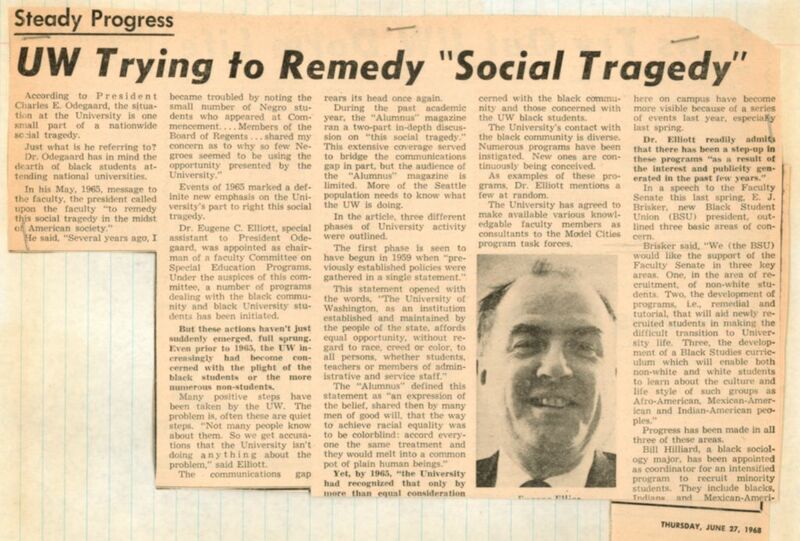 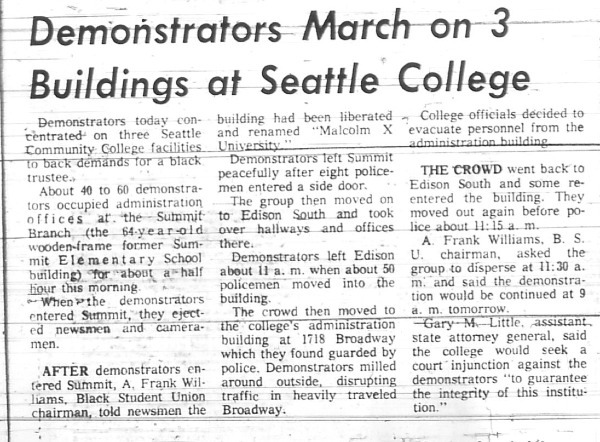 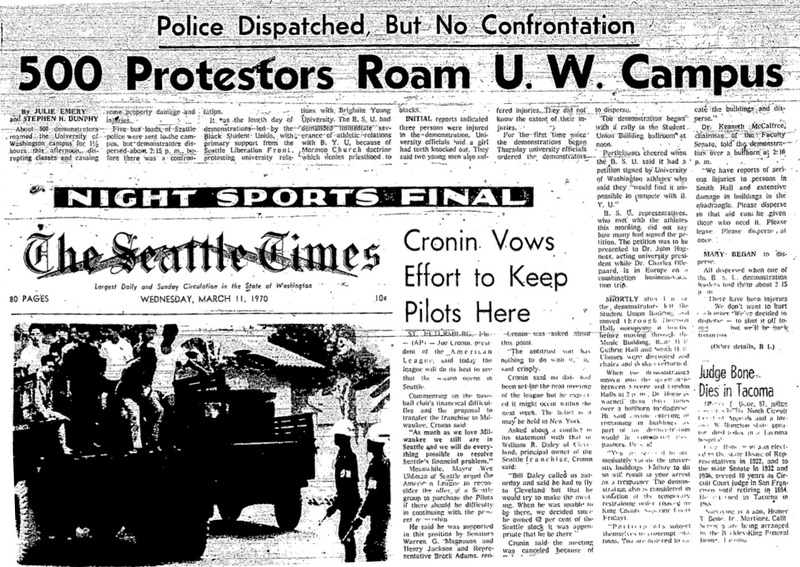 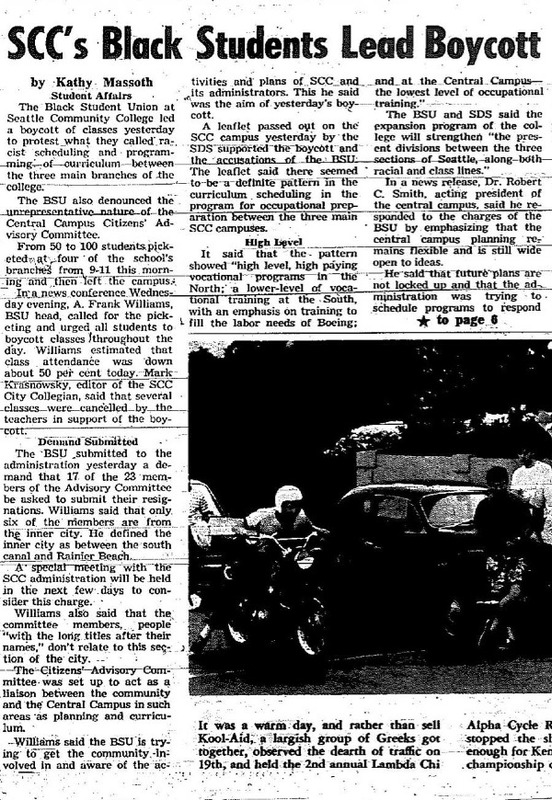 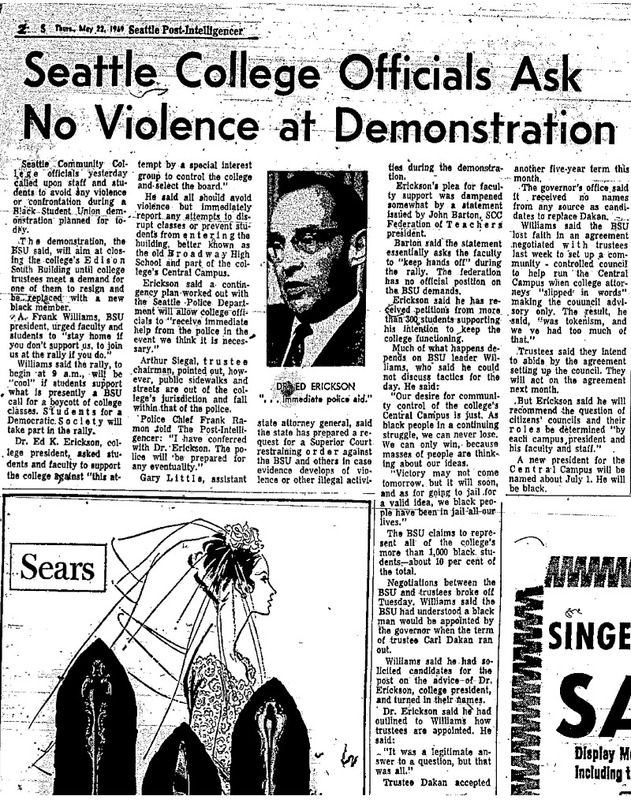 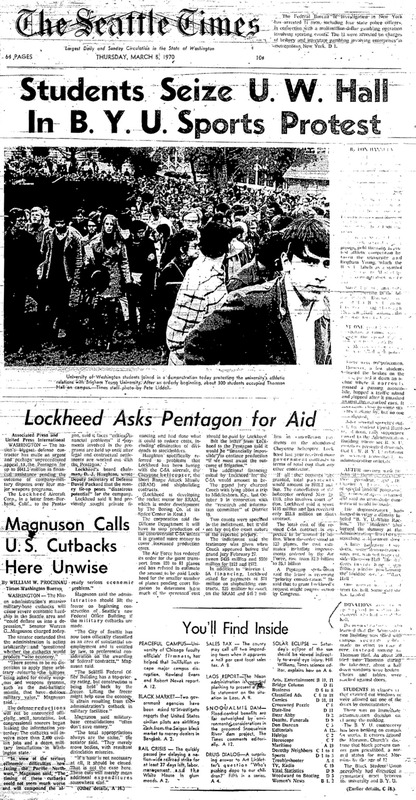 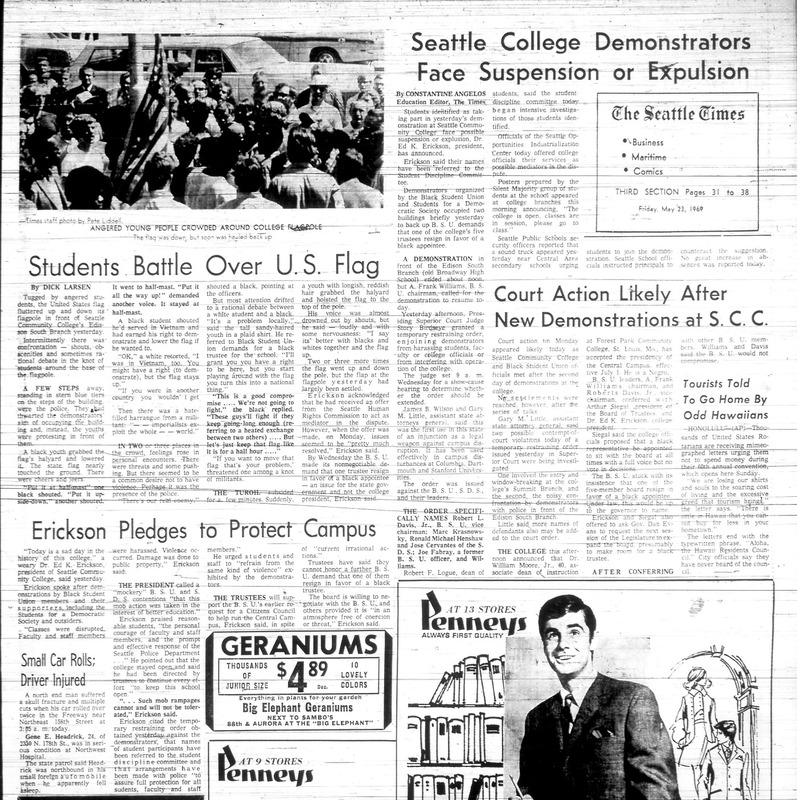 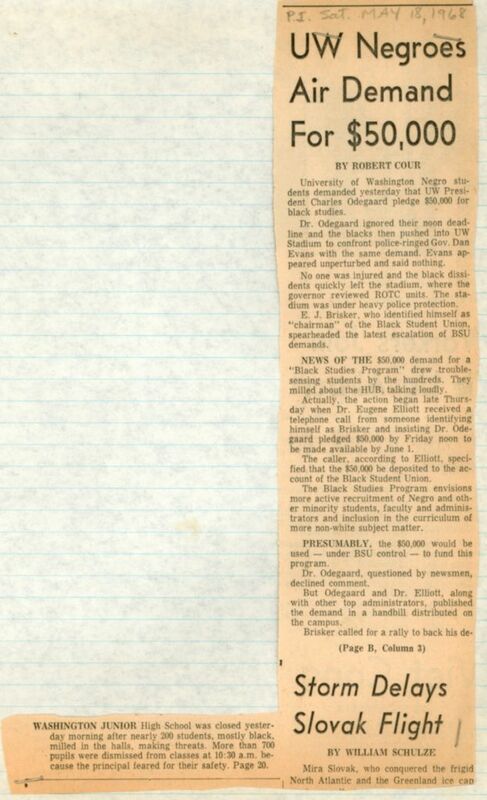 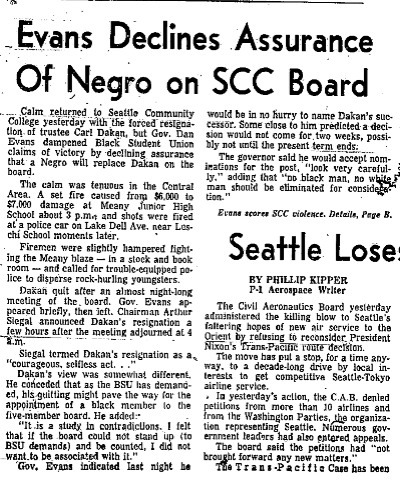 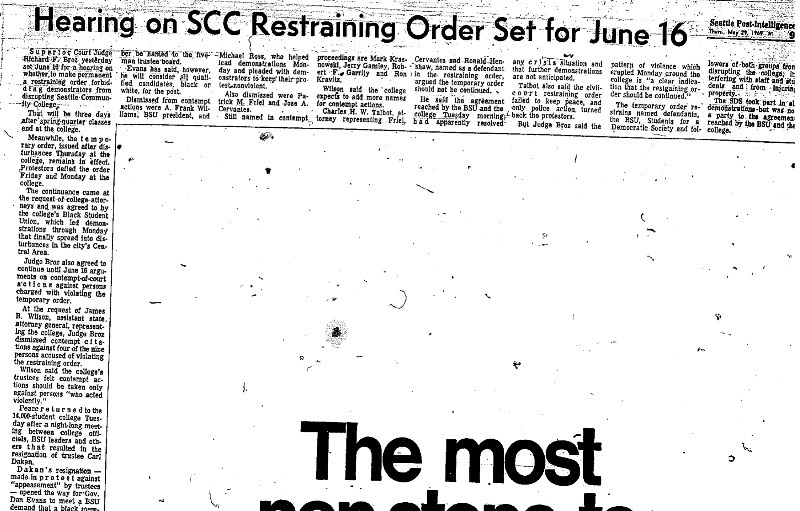 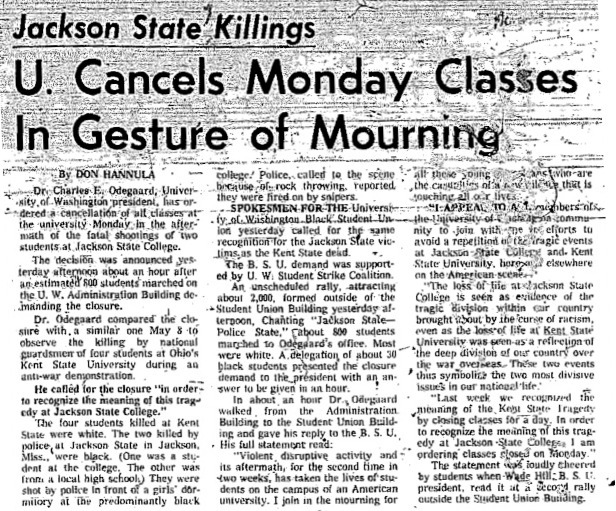 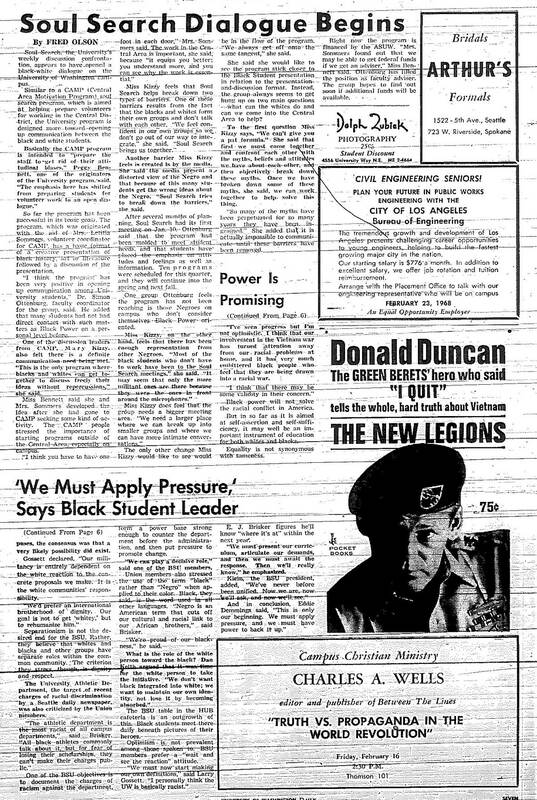 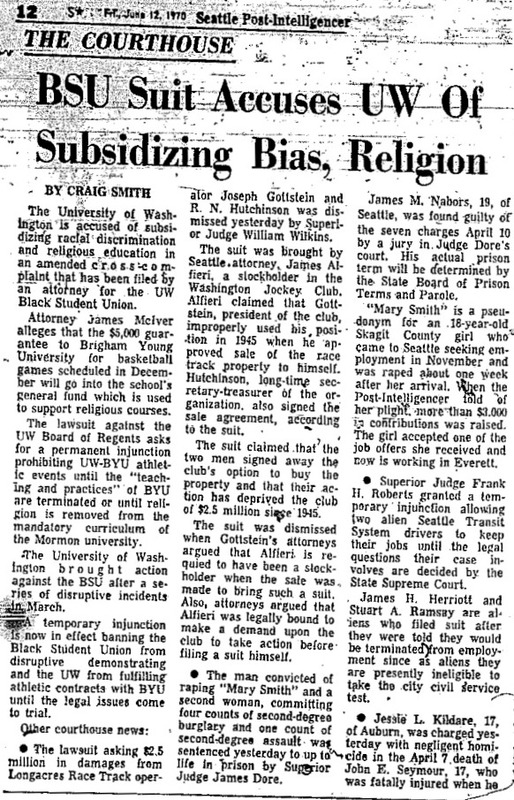 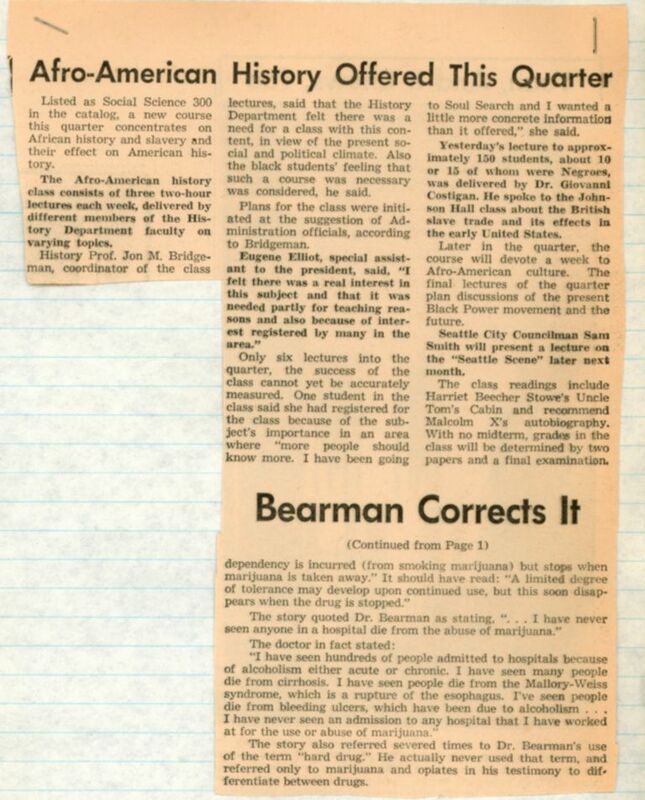 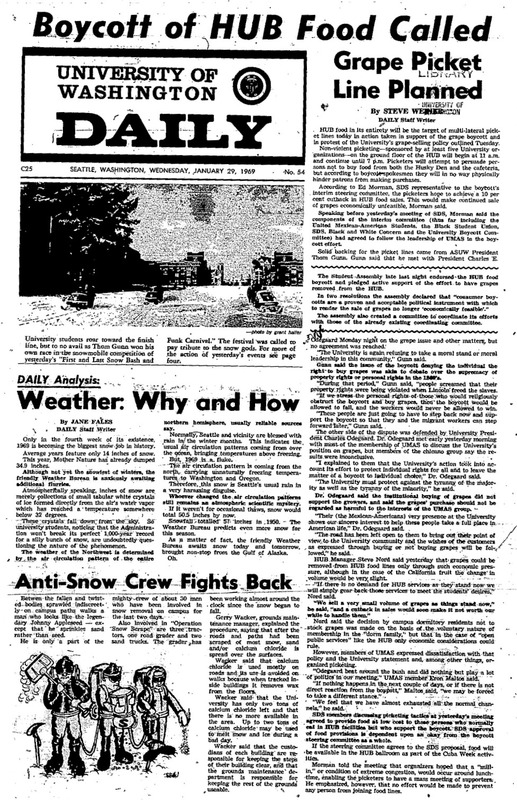 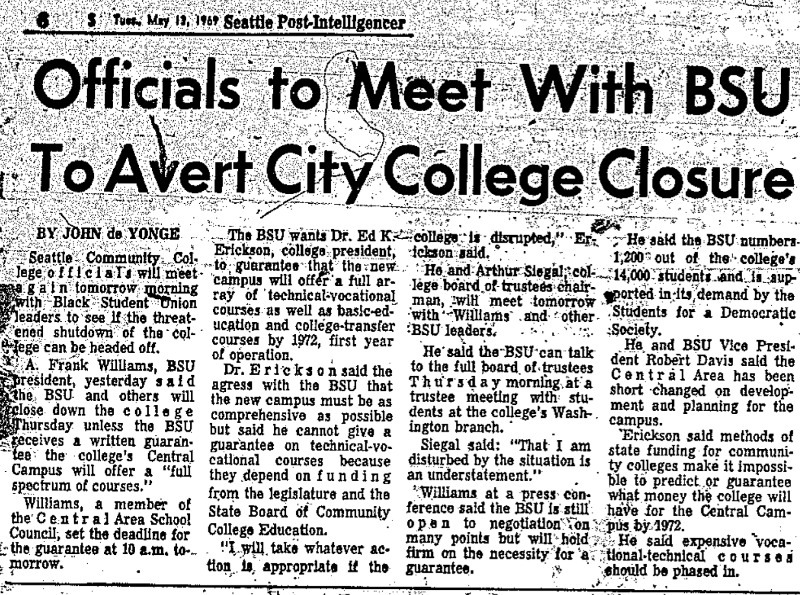 21-May-69 Seattle Times Erickson pledges "to keep school open"
23-May-69 Seattle Times Seattle College demonstrators face suspension or expulsion; Erickson pledges to protect campus... (other articles). 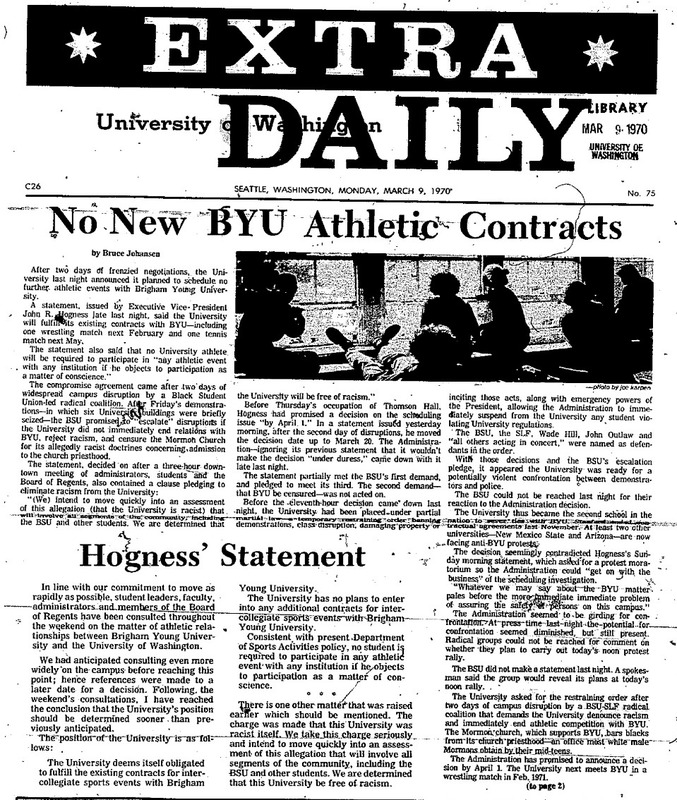 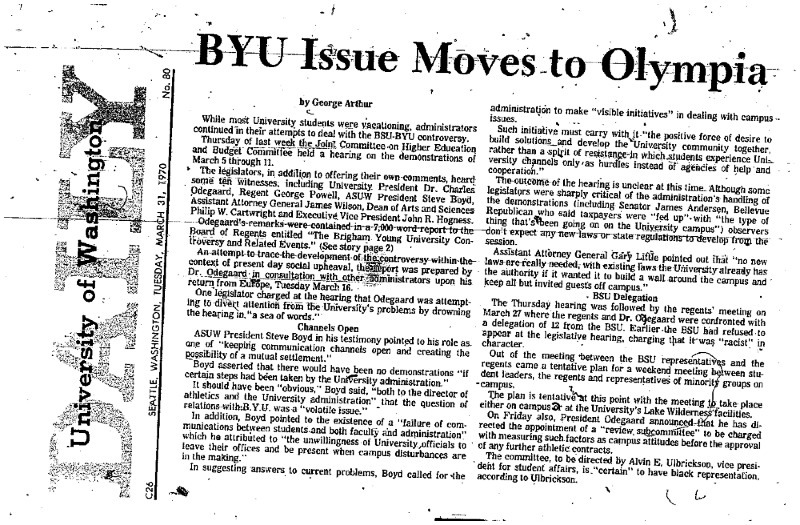 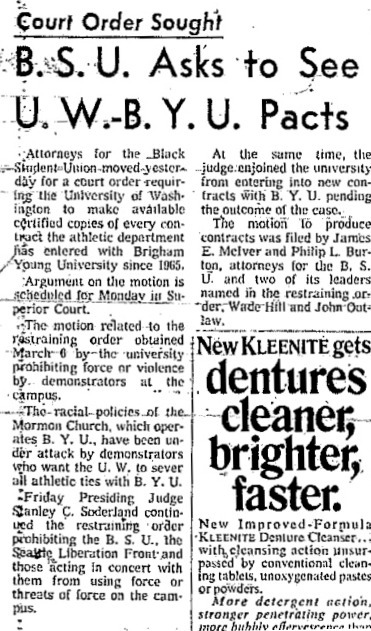 9-Mar-70 UW Daily No new BYU athletic contracts, cont. 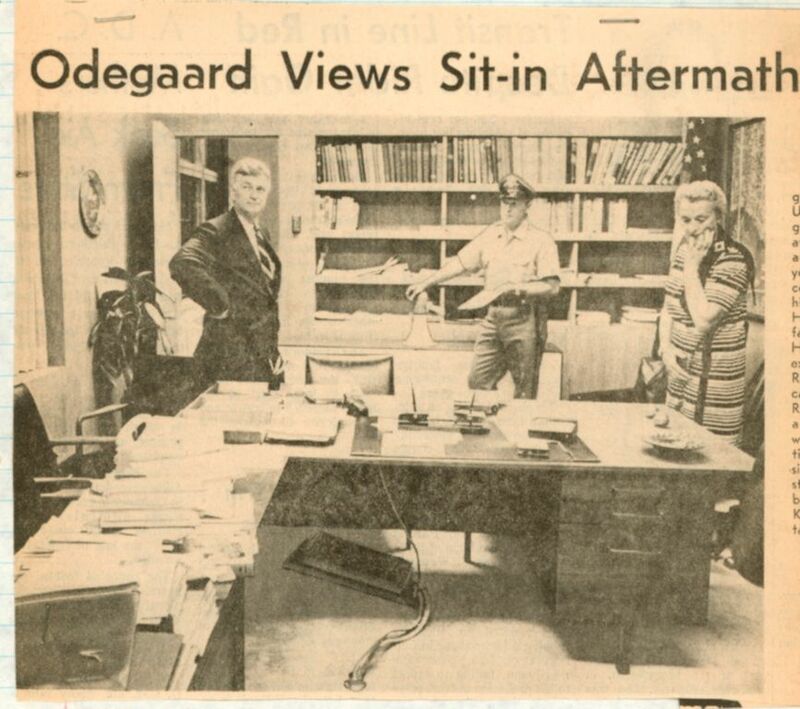 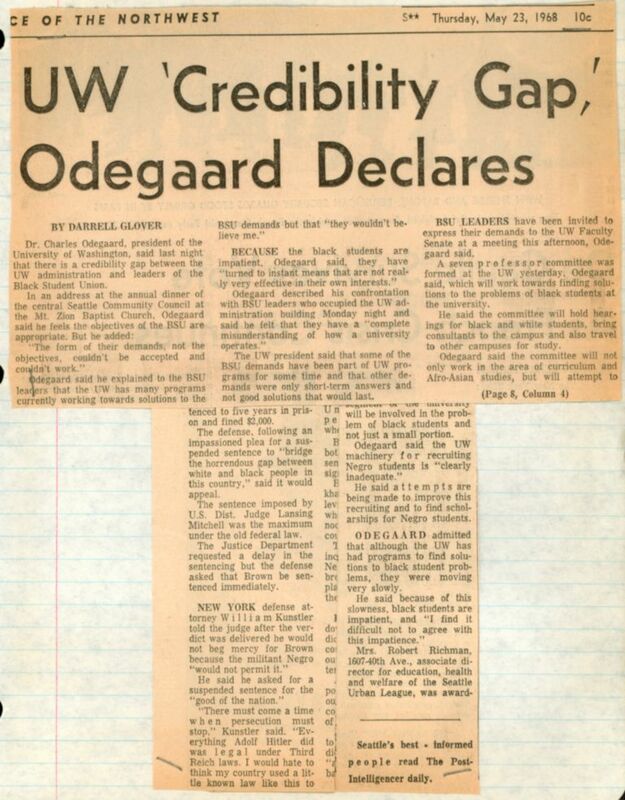 28-Mar-70 Seattle PI Text of Odegaard's statement on campus ferment, cont. 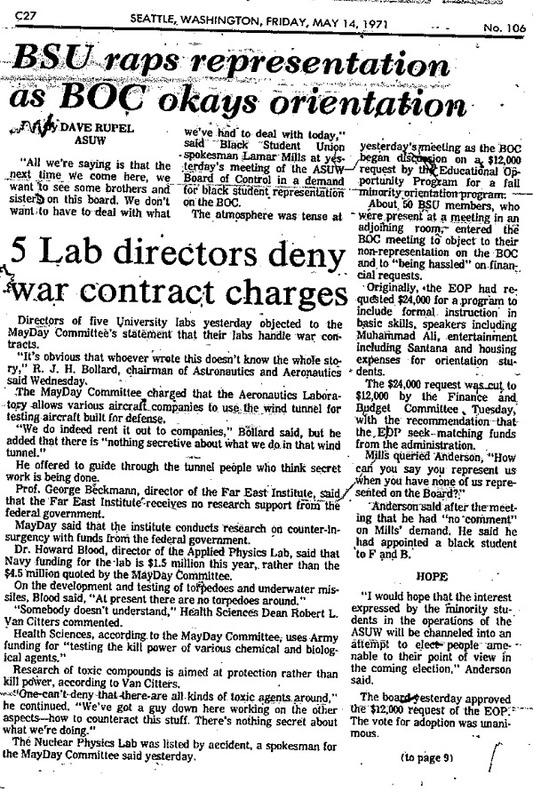 14-May-71 UW Daily BSU raps representation as BOC okays orientation, cont. 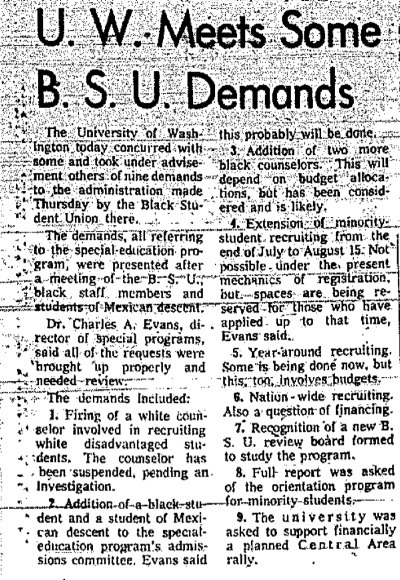 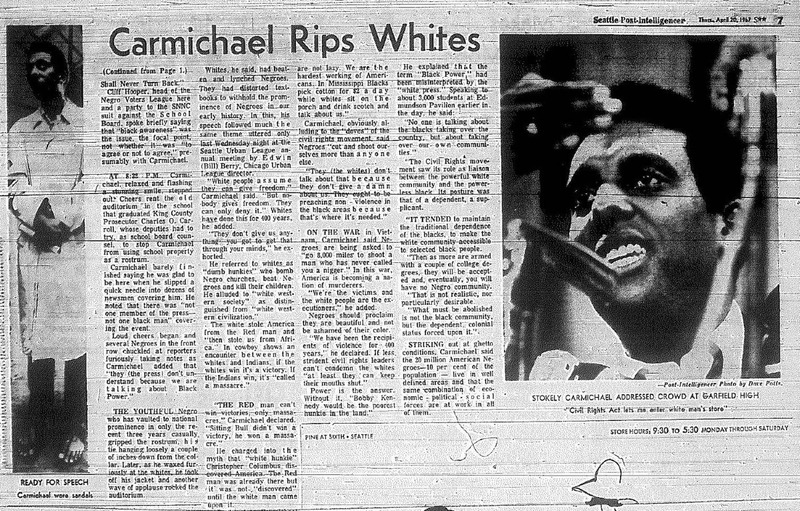 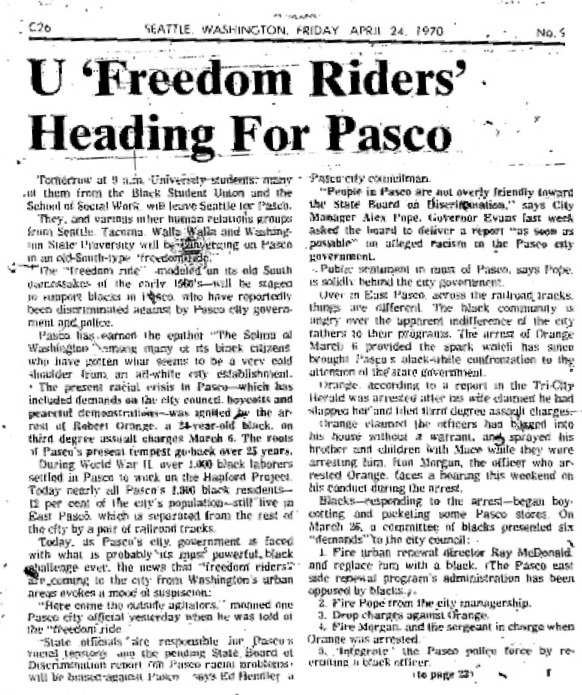 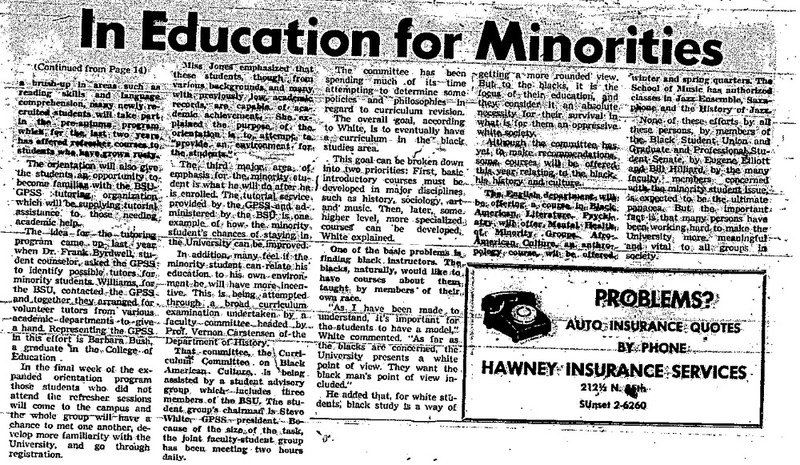 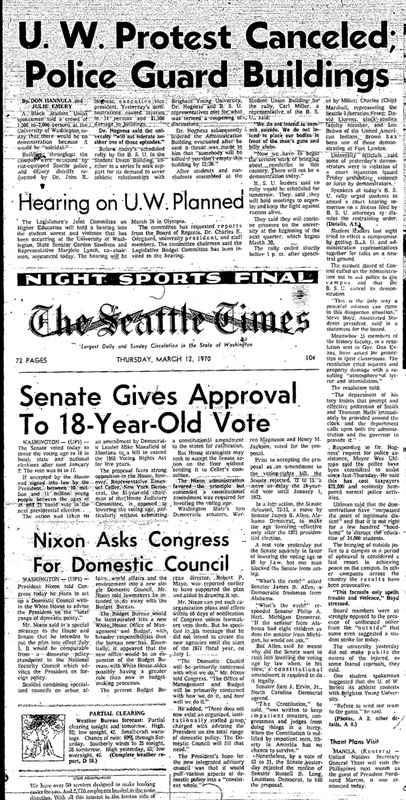 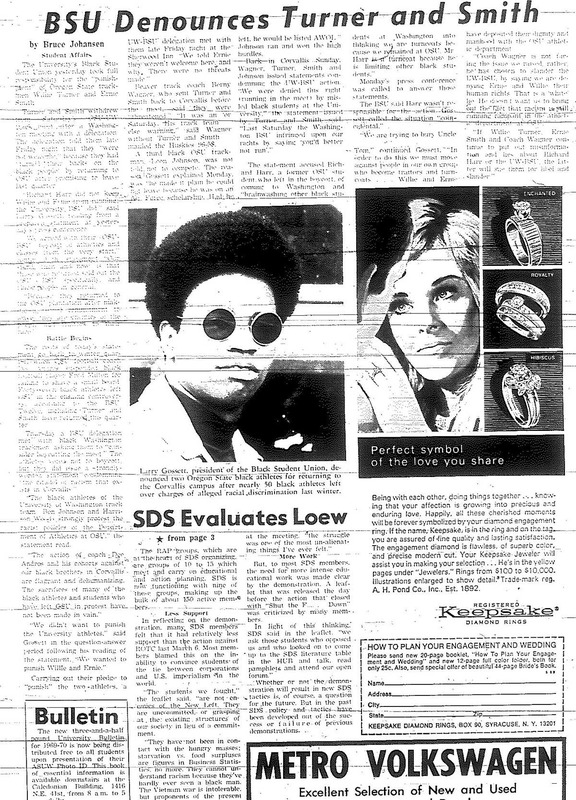 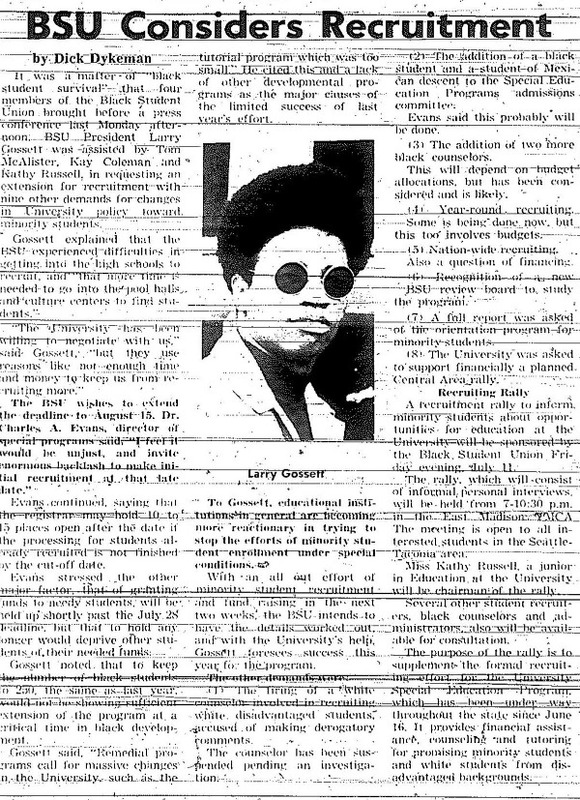 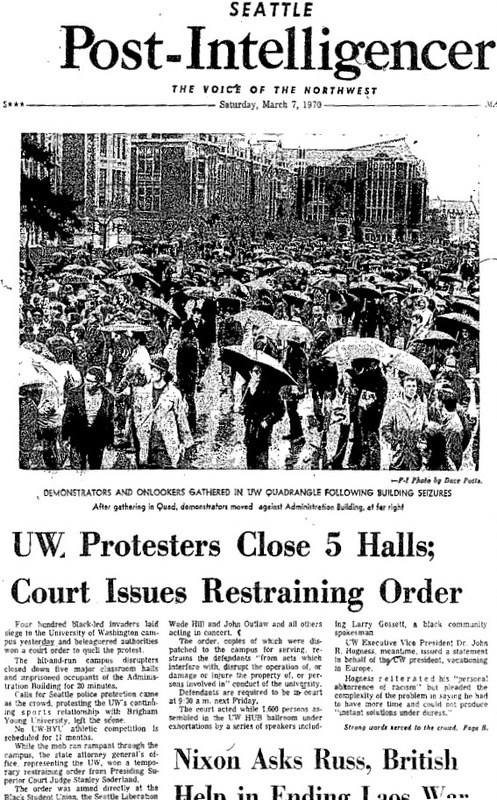 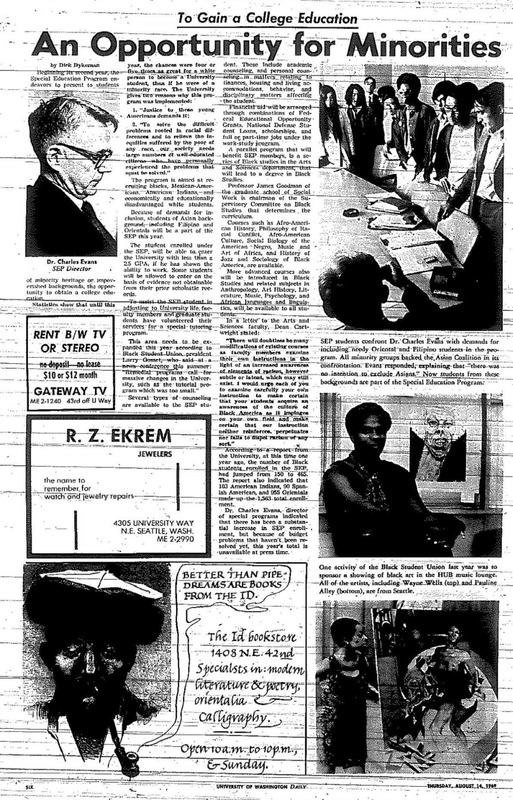 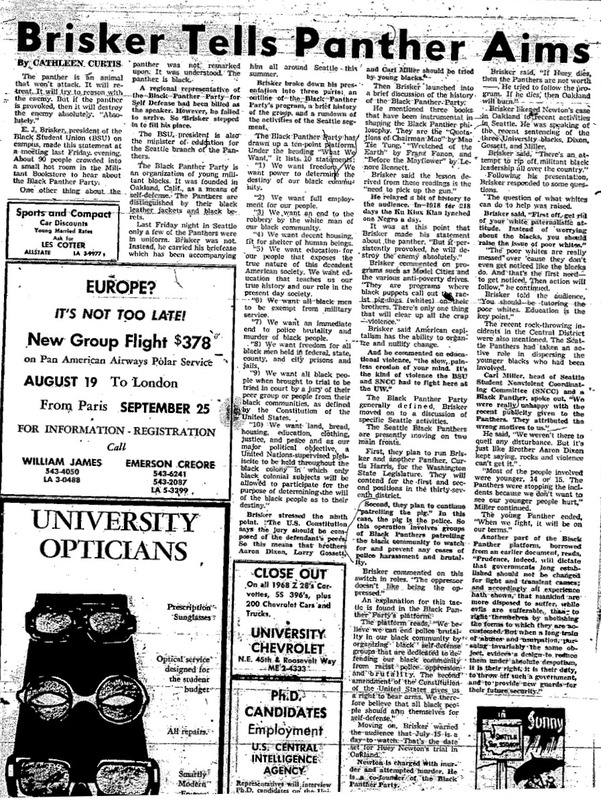 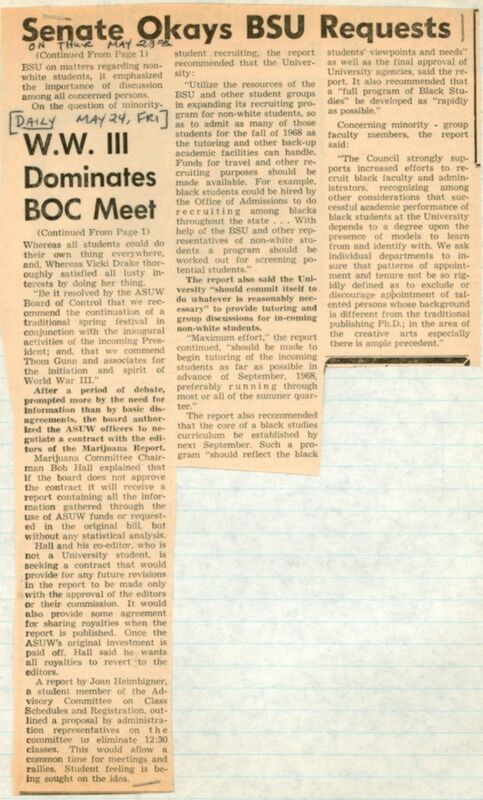 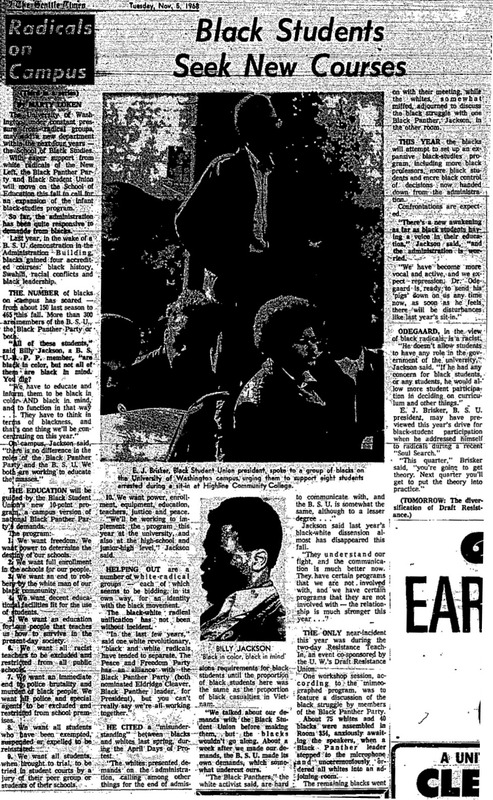 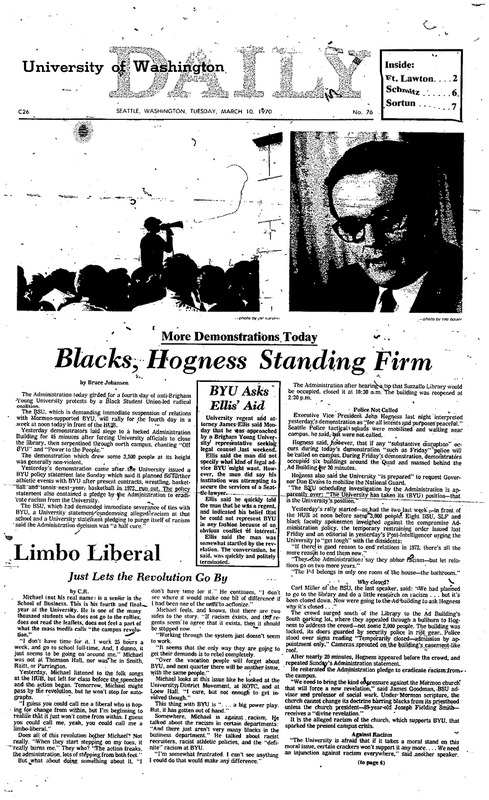 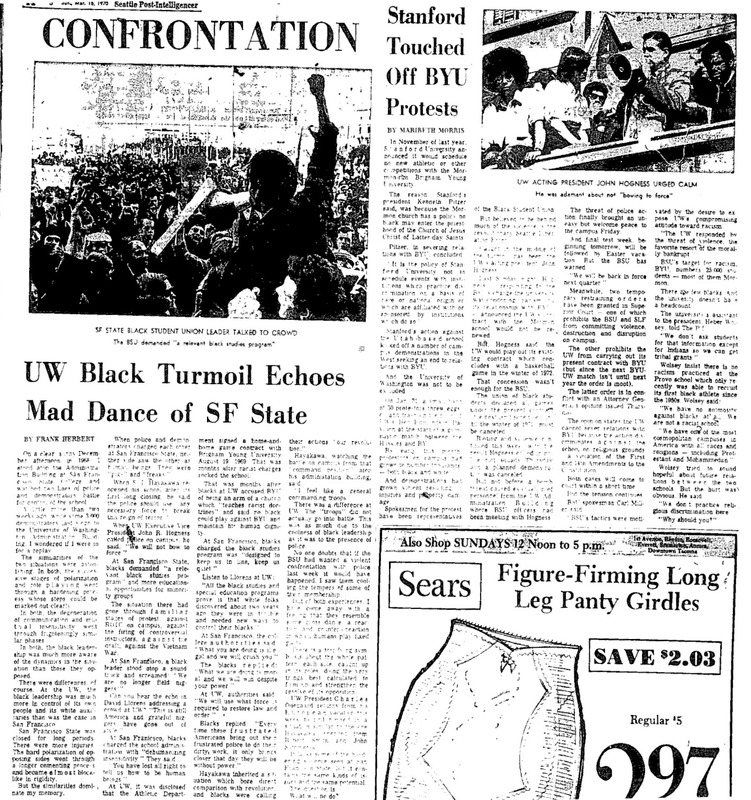 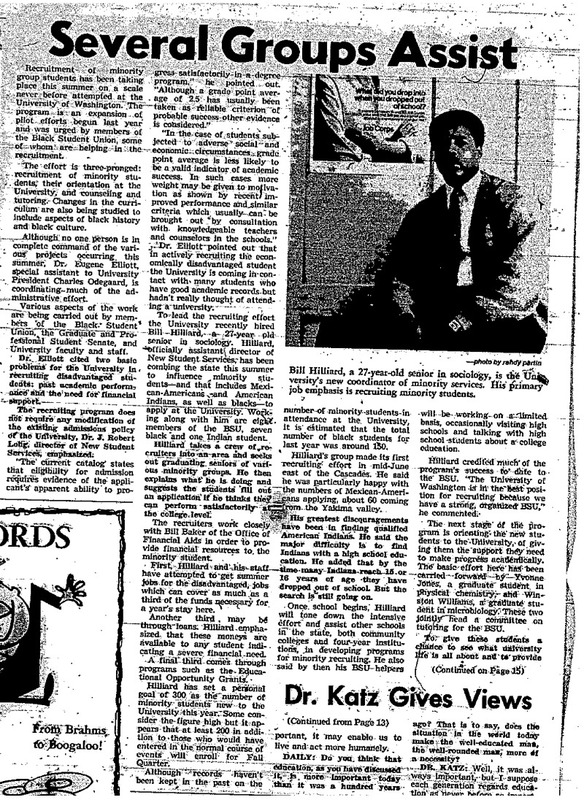 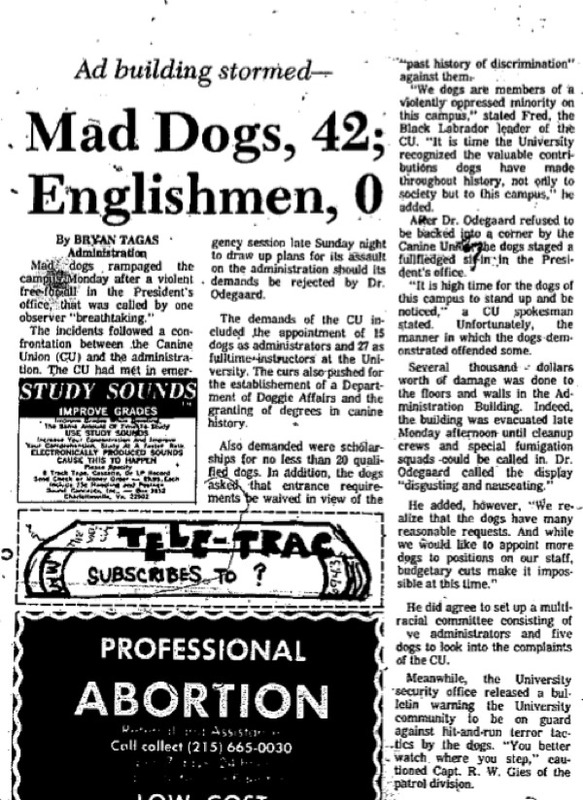 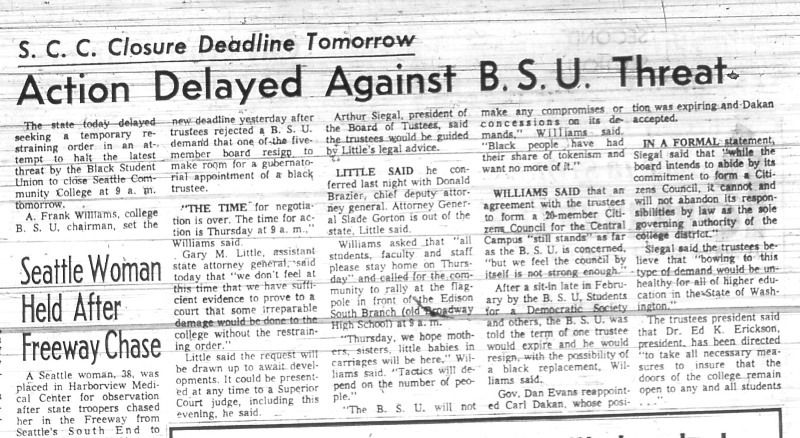 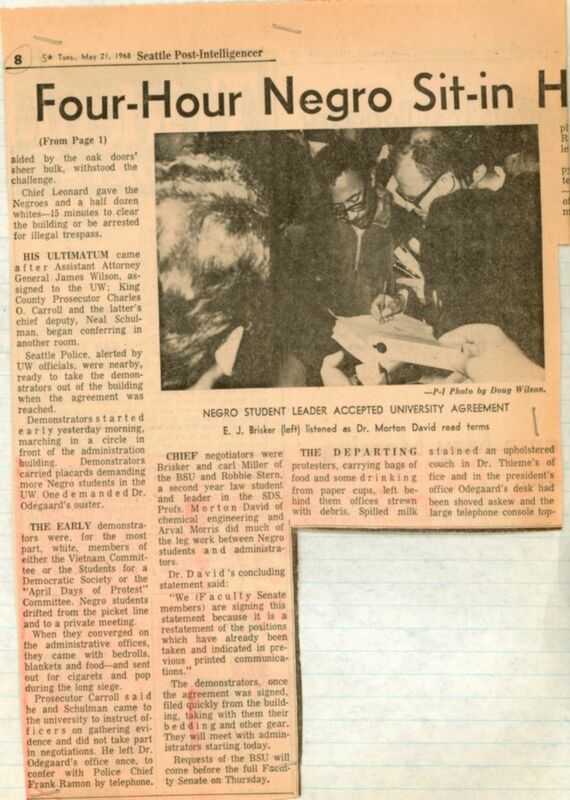 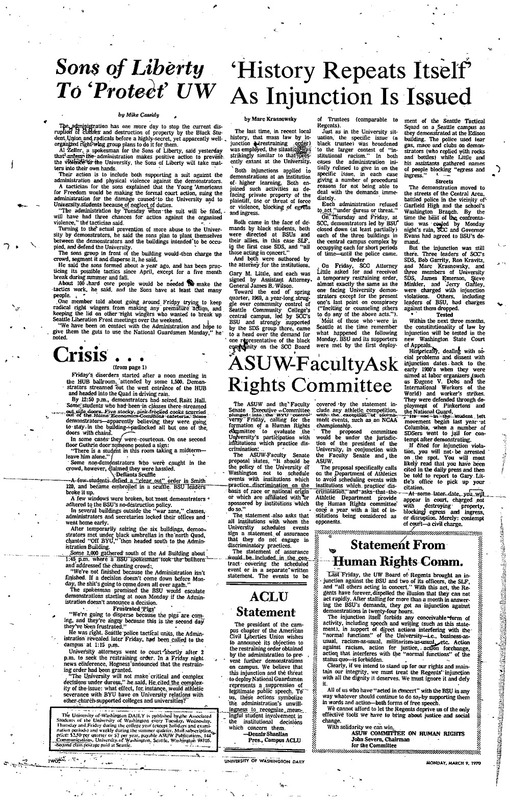 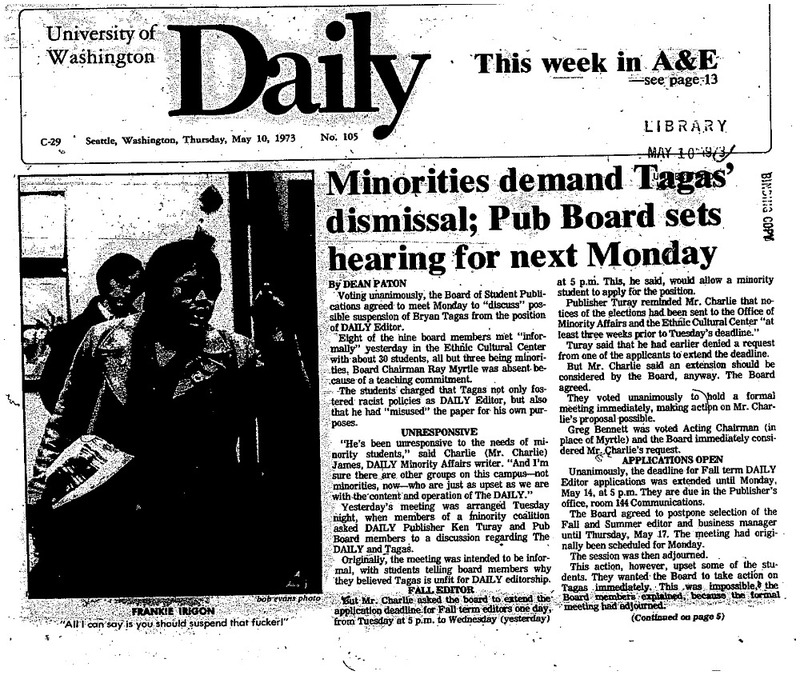 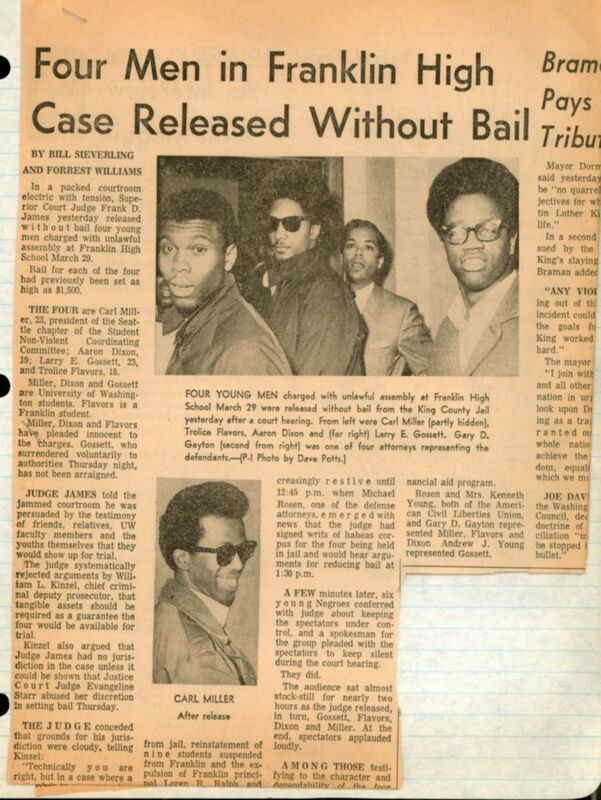 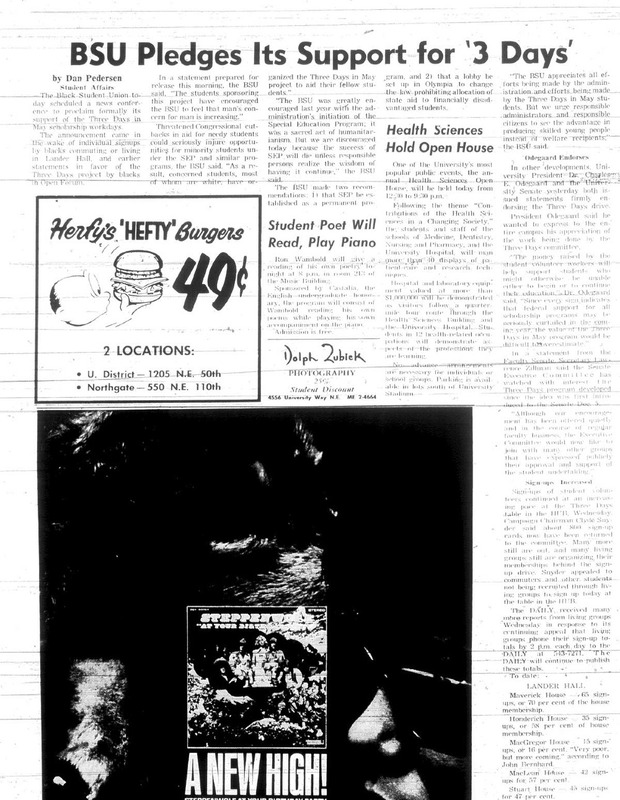 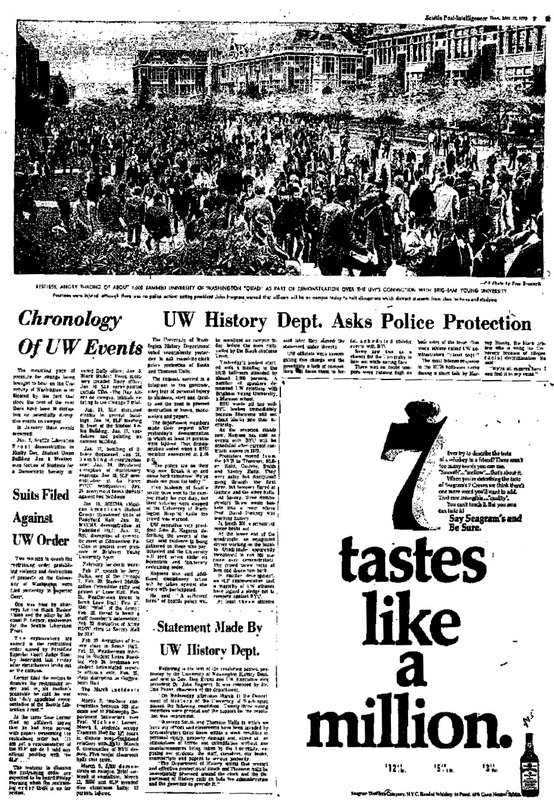 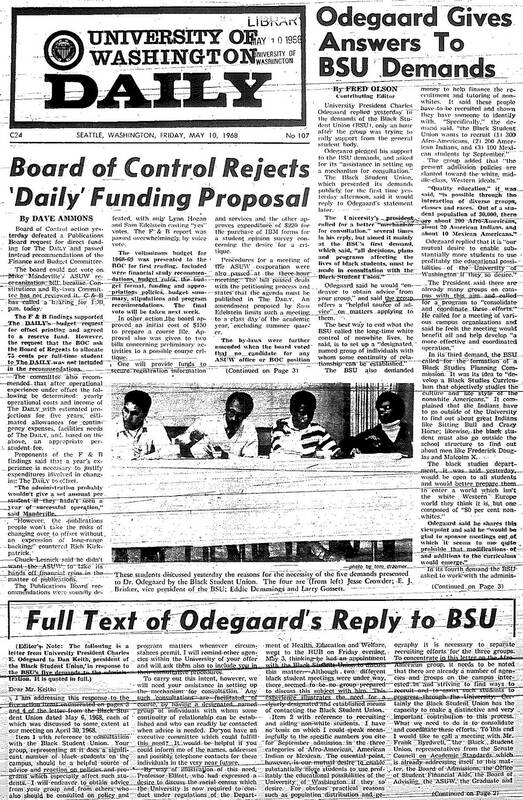 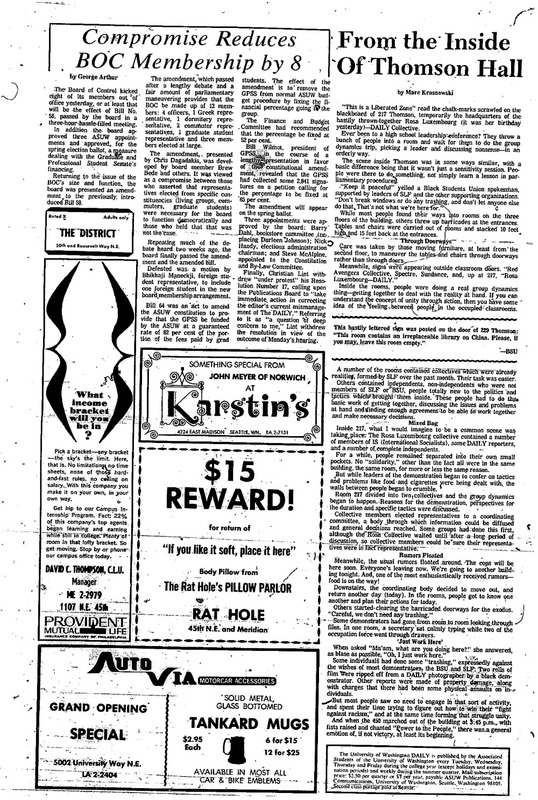 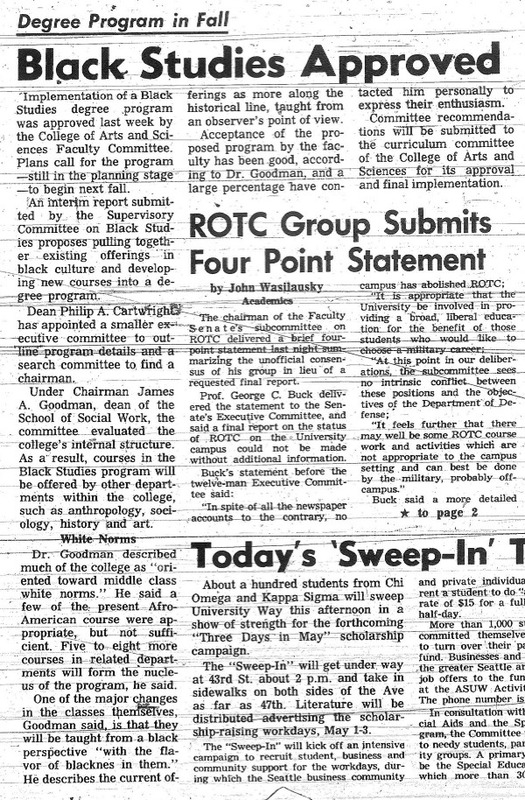 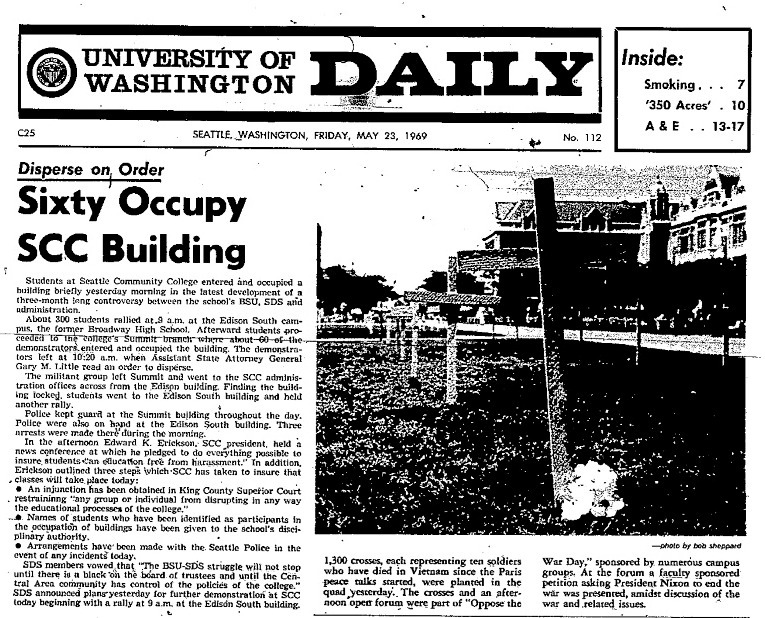 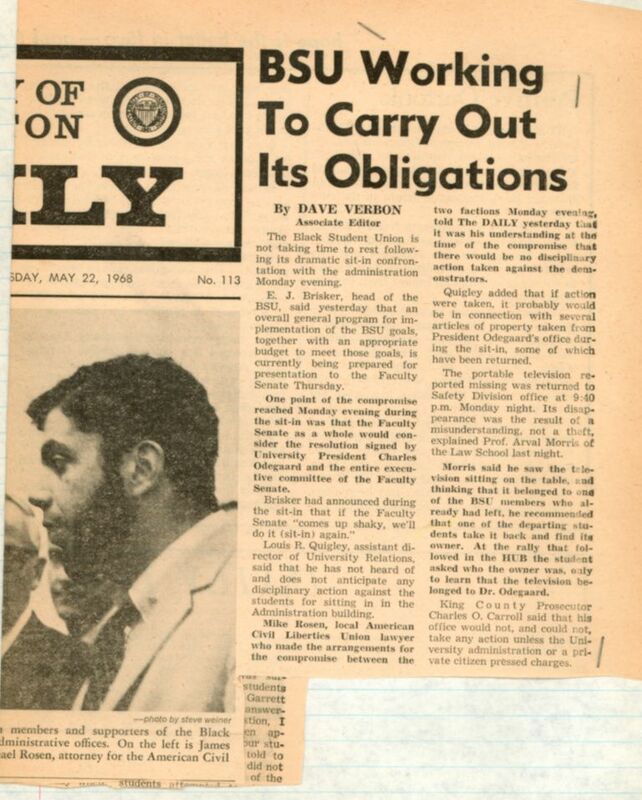 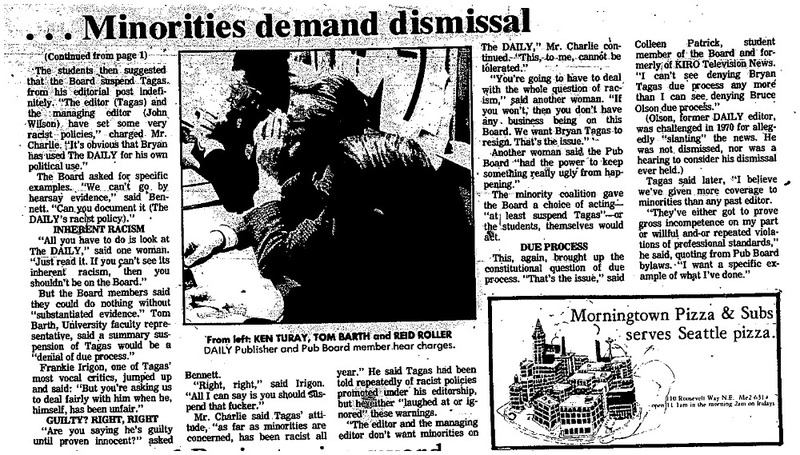 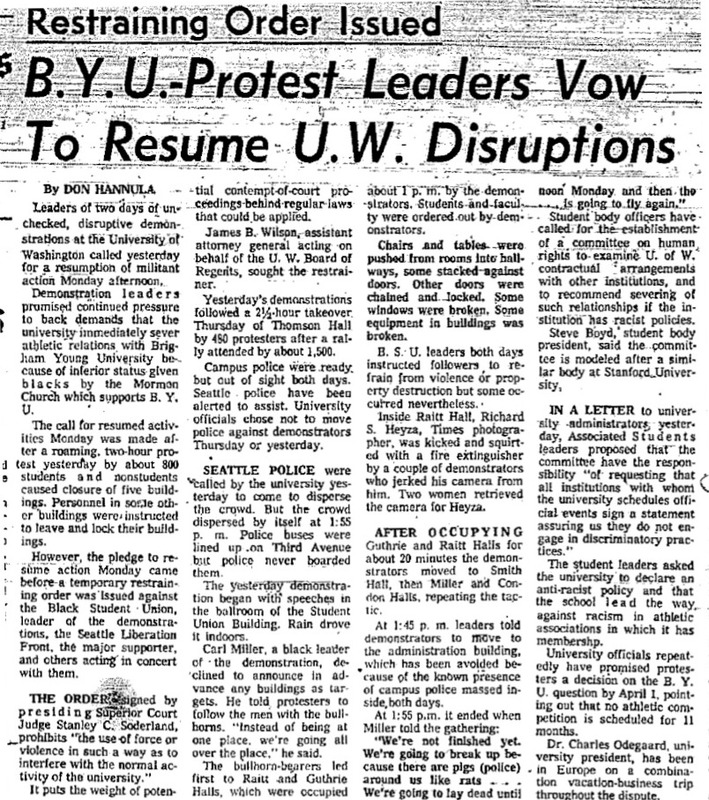 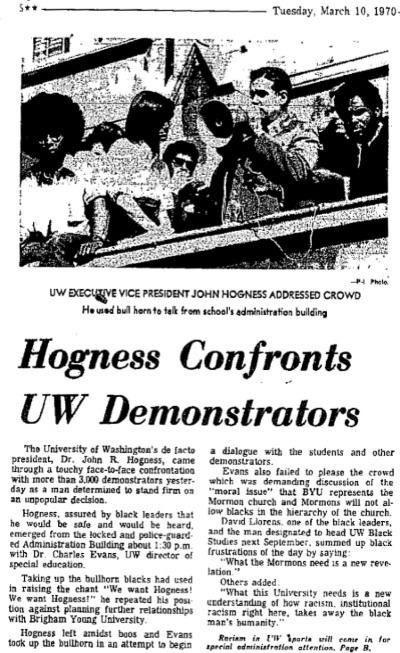 10-May-73 UW Daily Minorities demand Tagas' dismissal; Pub Board sets hearing for next Monday, cont. 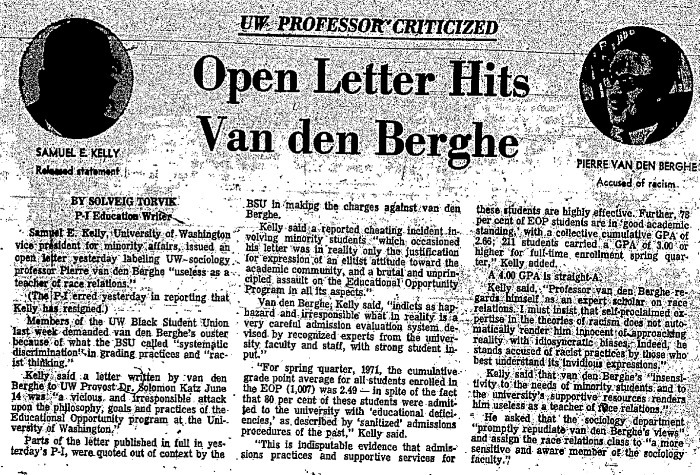 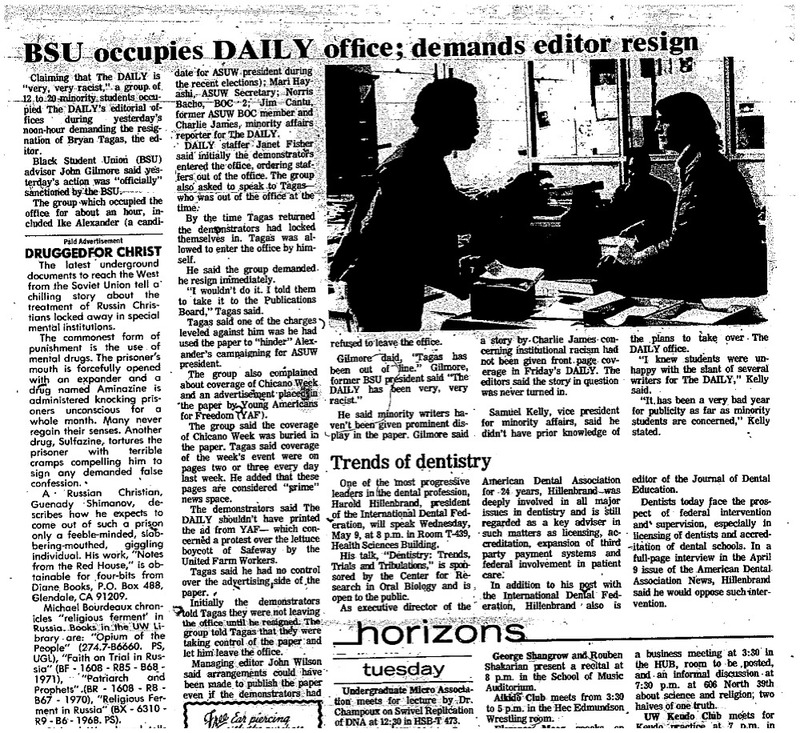 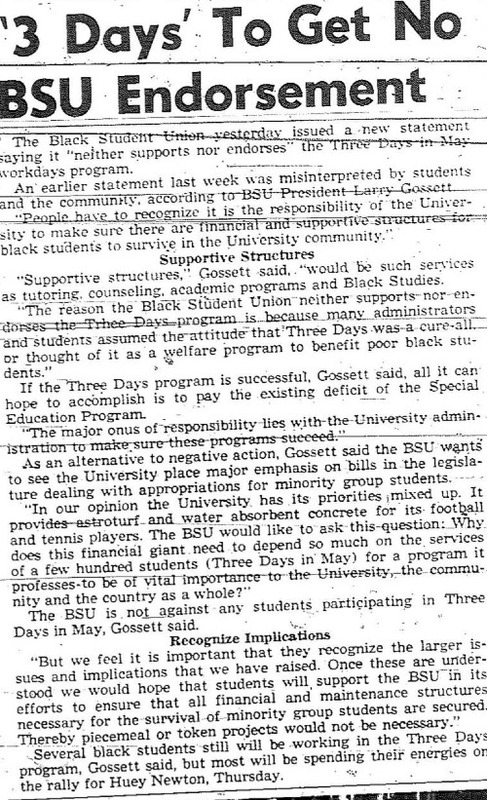 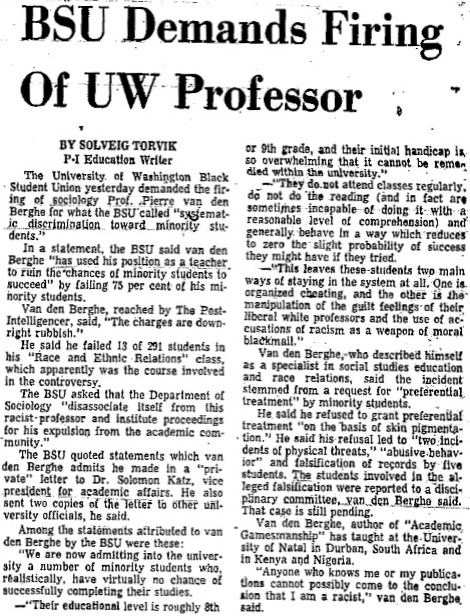 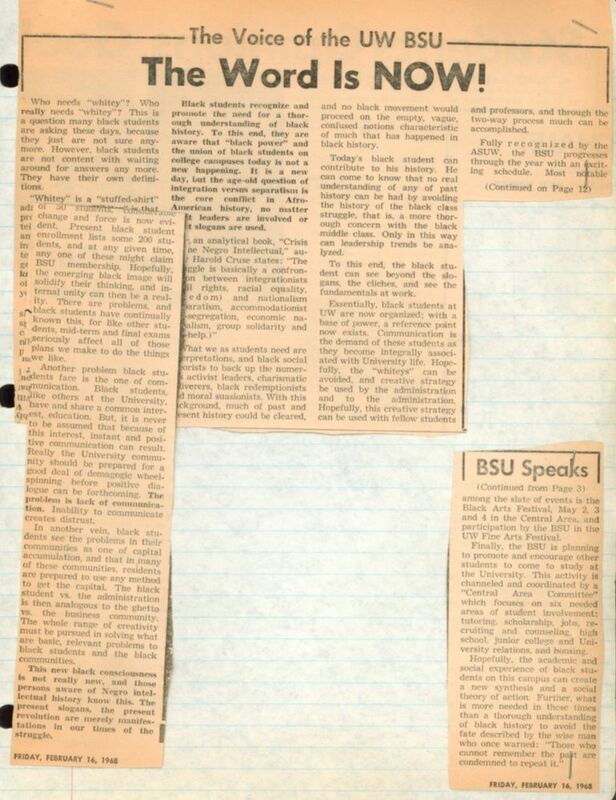 28-Feb-80 UW Daily Not enough faculty, says BSU president, cont. 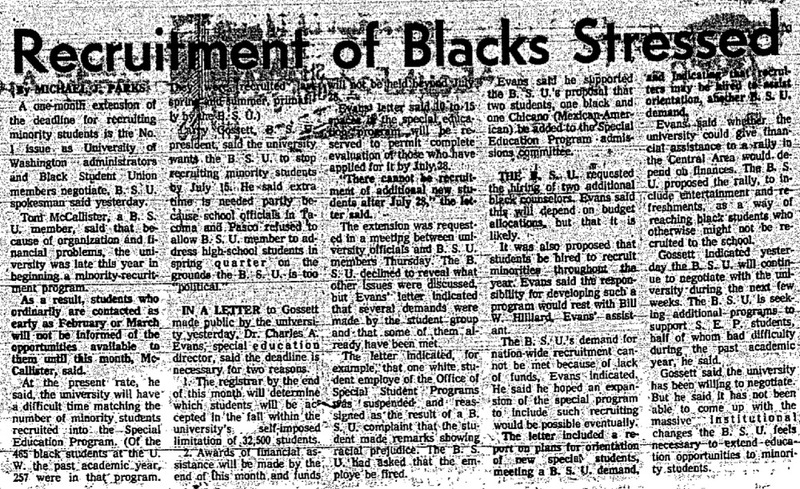 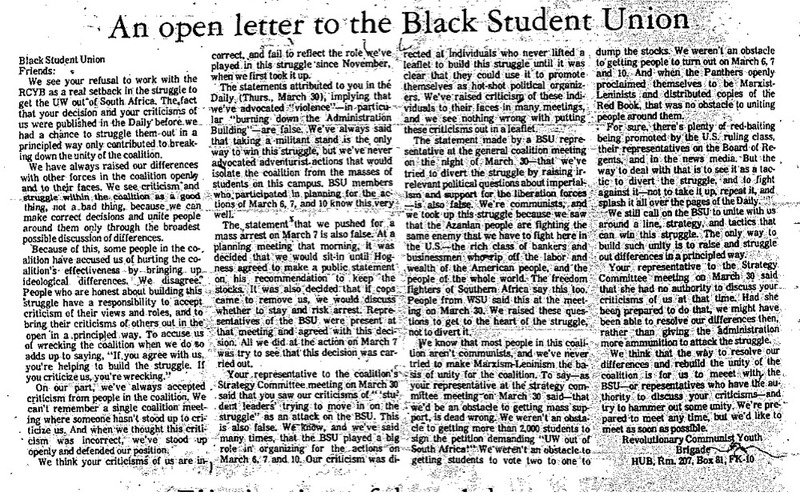 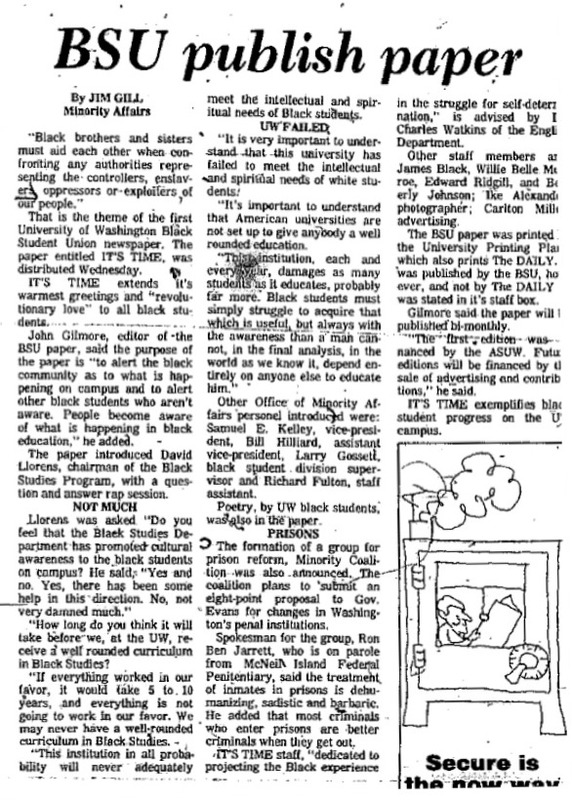 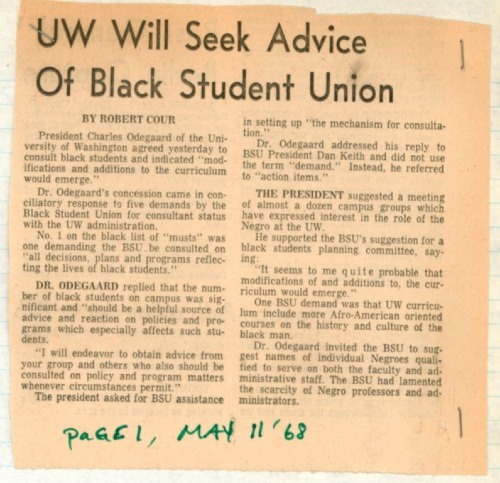 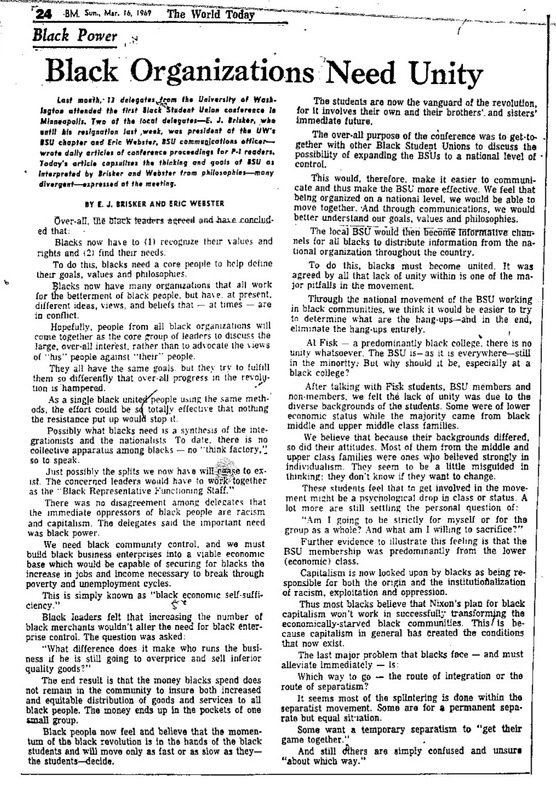 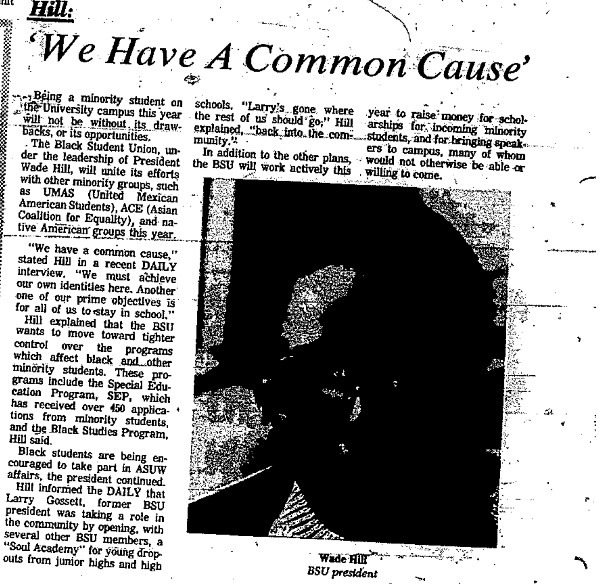 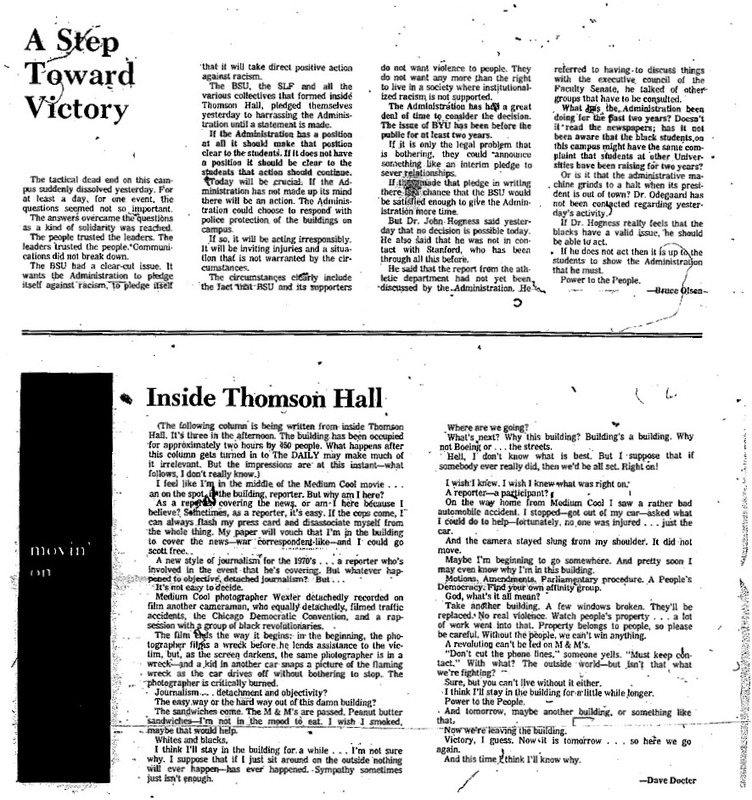 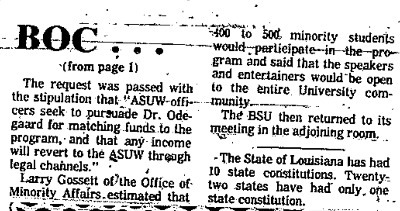 23-Jun-80 UW Daily Black Student Union working to regain leadership position, cont. 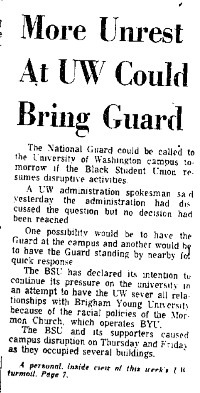 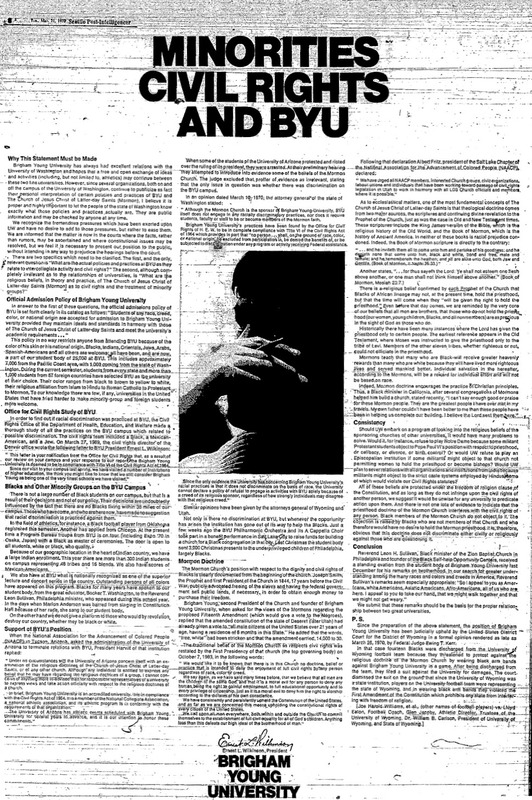 25-Jan-93 UW Daily Davis calls for return to activism, cont. 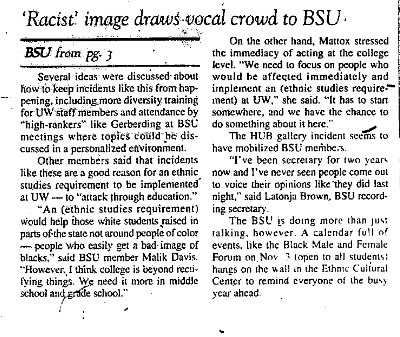 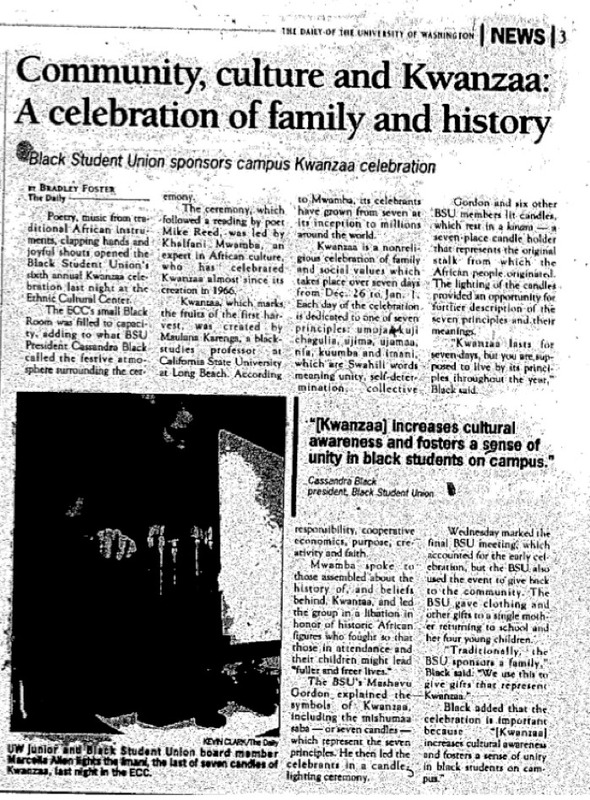 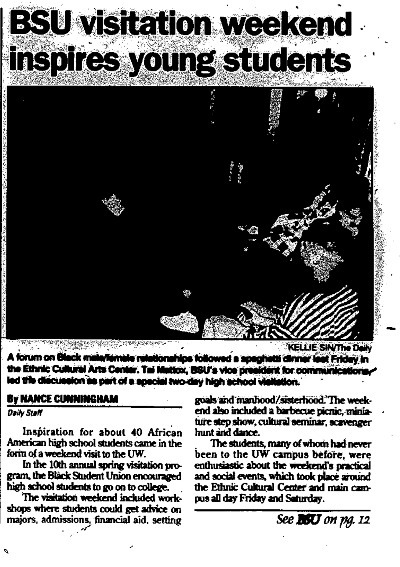 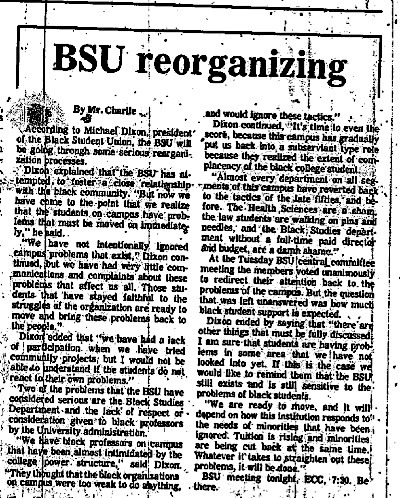 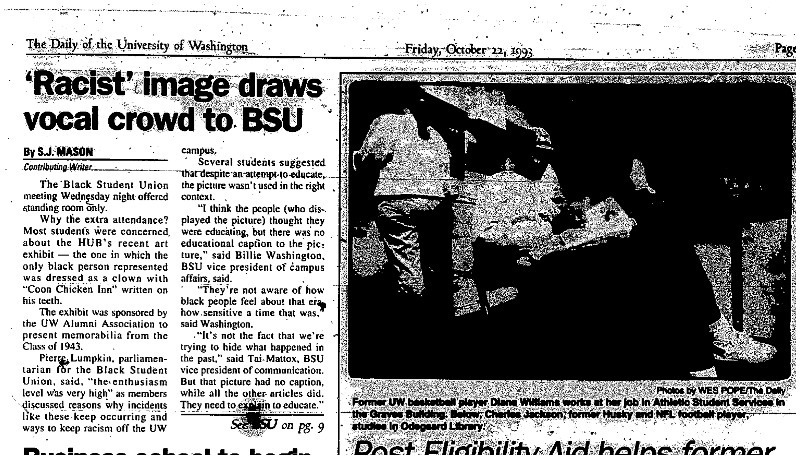 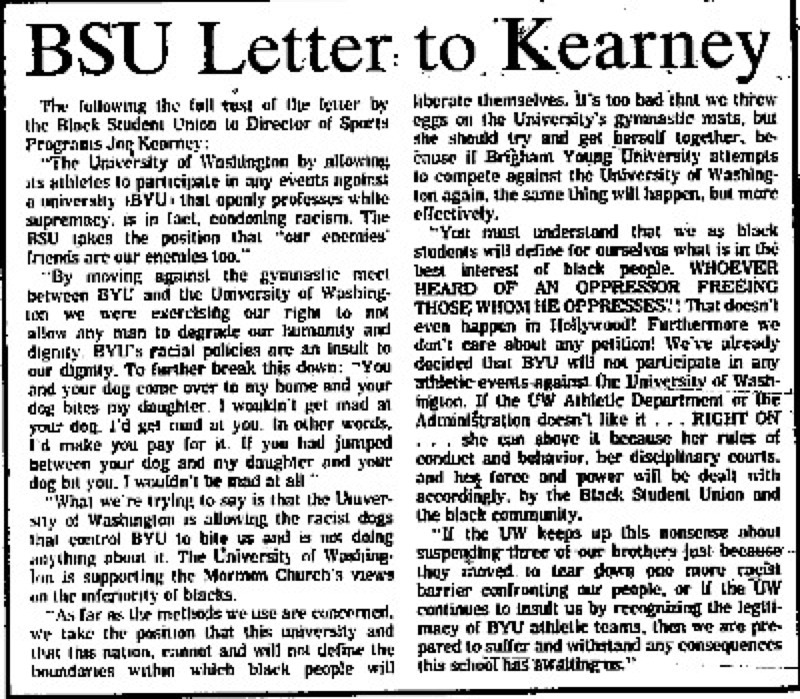 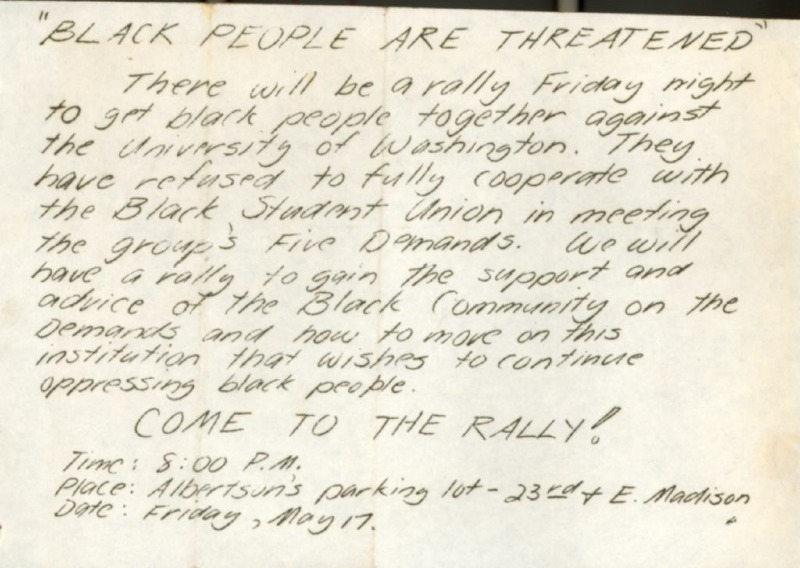 22-Oct-93 UW Daily Racist' image draws vocal crowd to BSU, cont. 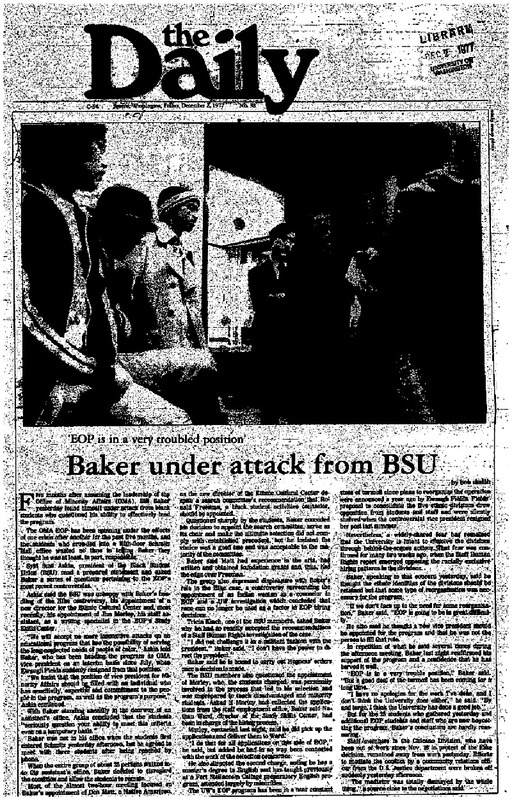 16-May-94 UW Daily BSU visitation weekend inspires young students, cont. 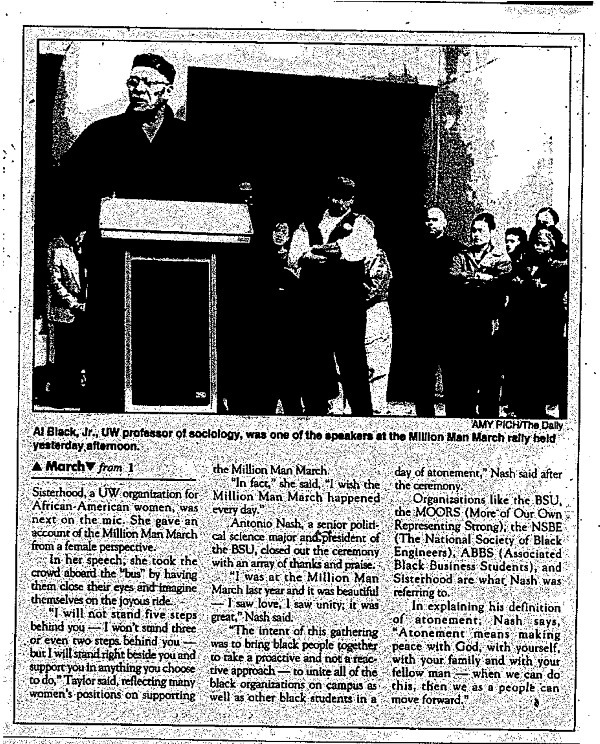 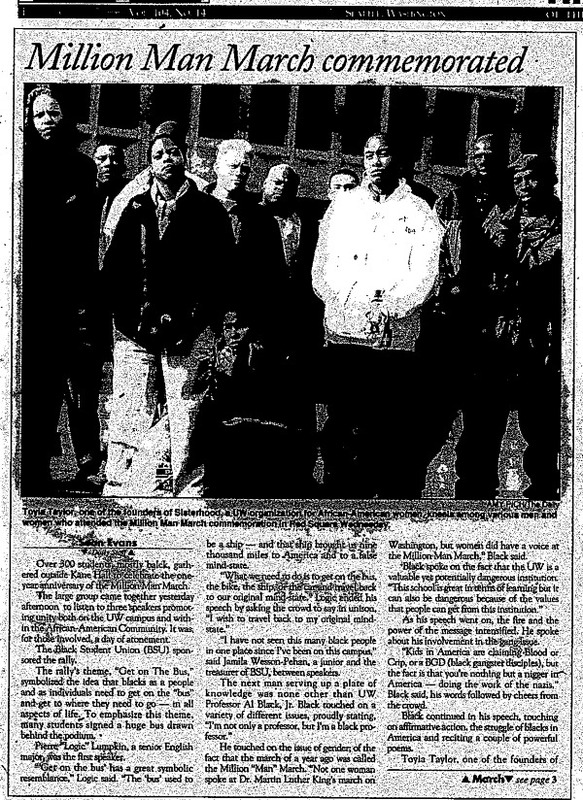 17-Oct-96 UW Daily Million Man March commemorated, cont. 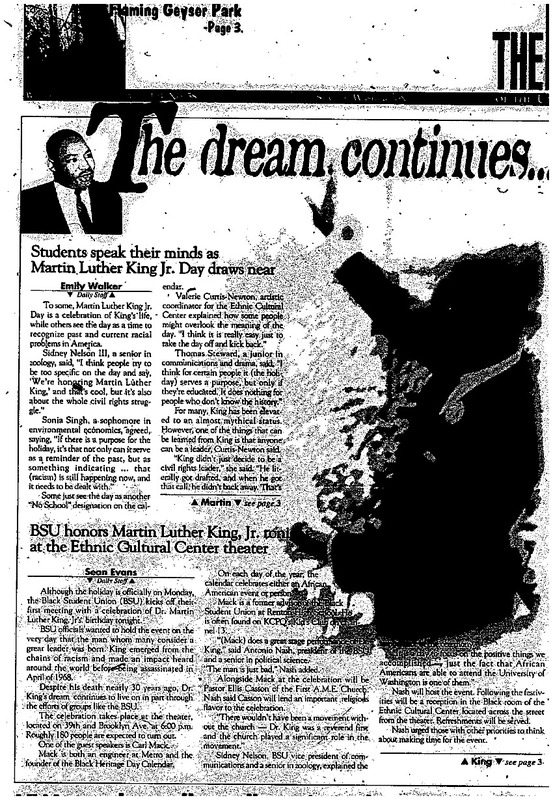 15-Jan-97 UW Daily BSU honors Martin Luther King, Jr. tonight at the Ethnic Cultural Center theater, cont. 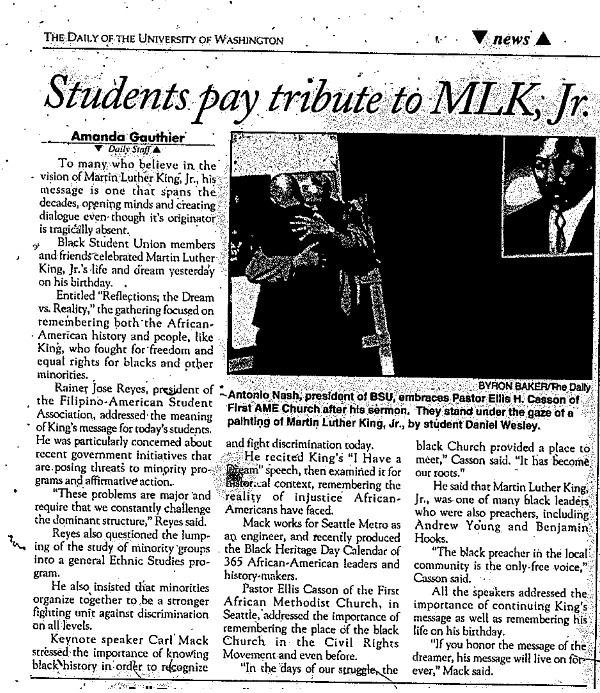 16-Jan-97 UW Daily Students pay tribute to MLK, Jr.
UW Daily Central Area - Worlds Away?